Mr. Issoufou Guéro, journalist, as Administrative and Technical Staff. 1. By a joint letter of notification dated 11 April 2002, filed in the Registry of the Court on 3 May 2002, the Republic of Benin (hereinafter "Benin") and the [p95] Republic of Niger (hereinafter "Niger") transmitted to the Registrar a certified copy of a Special Agreement, which was signed on 15 June 2001 in Cotonou and entered into force on 11 April 2002. whereby the Governments of the two States agreed to submit to a Chamber of the Court a dispute concerning "the definitive delimitation of the whole boundary between them". 1. The Parties submit the dispute defined in Article 2 below to a chamber of the Court, hereinafter the 'Chamber', formed in accordance with the provisions of the Statute of the Court and the present Special Agreement. 2. Each of the Parties shall exercise the right granted it by Article 31, paragraph 3, of the Statute of the Court to proceed to choose a judge ad hoc. (c) any other pleading whose filing, at the request of either of the Parties, shall have been authorized or directed by the Court. The Parties shall agree, with approval from the Chamber, on the order in which they are to be heard during the oral proceedings; if the Parties fail to agree, the order shall be prescribed by the Chamber. The Parties agree that their written pleadings and their oral argument shall be presented in the French language. The rules and principles of international law applicable to the dispute are those set out in Article 38, paragraph 1, of the Statute of the International Court of Justice, including the principle of State succession to the boundaries inherited from colonization, that is to say, the intangibility of those boundaries. 1. The Parties accept the judgment of the Chamber given pursuant to the present Special Agreement as final and binding upon them. 2. From the day on which the judgment is rendered, the Parties shall have eighteen (18) months in which to commence the works of demarcation of the boundary. 3. In case of difficulty in the implementation of the judgment, either Party may seise the Court pursuant to Article 60 of its Statute. The present Agreement shall be registered with the Secretariat of the United Nations pursuant to Article 102 of the United Nations Charter by the more diligent Party. 1. In accordance with Article 40 of the Statute of the Court, the present Special Agreement shall be notified to the Registrar of the Court by a joint letter from the Parties. 2. If such notification is not effected in accordance with the preceding paragraph within one month from the entry into force of the present Special Agreement, it shall be notified to the Registrar of the Court by the more diligent Party. Pending the judgment of the Chamber, the Parties undertake to preserve peace, security and quiet among the peoples of the two States. In witness whereof, the present Special Agreement, drawn up in two original copies, has been signed by the plenipotentiaries. Done at Cotonou, 15 June 2001." 3. Pursuant to Article 40, paragraph 3, of the Statute of the Court and Article 42 of the Rules of Court, the Registrar transmitted copies of the joint letter of notification, of the Special Agreement and of the protocol of exchange of the instruments of ratification to the Secretary-General of the United Nations, the Members of the United Nations and other States entitled to appear before the Court. 4. Article 1 of the Special Agreement provides for the submission of the dispute to a Chamber to be formed in accordance with Article 26, paragraph 2, of the Statute, with a judge ad hoc to be chosen by each Party pursuant to Article 31 of the Statute. The Parties, having been duly consulted by the President of the Court regarding the composition of the Chamber, expressed their wish, pursuant to Article 26, paragraph 2, of the Statute, and to Article 17, paragraph 2, of the Rules of Court, for the formation of a Chamber of five members, of whom two would be the judges ad hoc to be chosen by them. 5. By a letter of 21 August 2002 the Deputy Agent of Benin informed the Court that his Government had chosen Mr. Mohamed Bennouna to sit as judge ad hoc. By a letter of 11 September 2002 the Agent of Niger informed the Court that his Government had chosen Mr. Mohammed Bedjaoui to sit as judge ad hoc. 7. By the same Order, the Court, acting pursuant to Article 92, paragraph 1, of the Rules of Court, fixed 27 August 2003 as the time-limit for the filing of a Memorial by each Party and reserved the subsequent procedure for further decision. The Memorials were duly filed within the time-limit thus fixed. 8. By Order of 11 September 2003, the President of the Chamber, having regard to Article 3, paragraph 1 (b), of the Special Agreement, fixed 28 May 2004 as the time-limit for the filing of a Counter-Memorial by each Party and reserved the subsequent procedure for further decision. 9. The Chamber held a public sitting on 20 November 2003 to enable the judges ad hoc to make the solemn declaration required by Article 31, paragraph 6, of the Statute and by Article 8 of the Rules of Court. 11. By a letter of 11 October 2004, Judge Guillaume, President of the Chamber, informed the President of the Court, pursuant to Article 13, paragraph 4, of the Statute, that he had decided to resign from the Court with effect from 11 February 2005. Since his resignation would leave a vacancy in the Chamber, the President of the Court consulted the Parties again on 11 January 2005 regarding the composition of the Chamber. At an election held on 16 February 2005, Judge Abraham was elected a member of the Chamber to fill the seat left vacant by Judge Guillaume's resignation. By an Order of 16 February 2005, the Court declared that, as a result of this election, the Chamber was now composed as follows: Judge Ranjeva, who, in his capacity as Vice-President of the Court, had become President of the Chamber, pursuant to Article 18, paragraph 2, of the Rules of Court; Judges Kooijmans and Abraham; and Judges ad hoc Bedjaoui and Bennouna. 12. By a letter of 11 February 2005, the Agent of Niger expressed his Government's wish to produce two new documents pursuant to Article 56 of the Rules of Court. By a letter of 25 February 2005, the Agent of Benin informed the Chamber that his Government did not object to that production. Following the decision of the Chamber to authorize the production of those documents by Niger, the Registrar advised the Parties of that decision by letters dated 2 March 2005. 13. Pursuant to Article 53, paragraphs, of the Rules of Court, the Chamber, having ascertained the views of the Parties, decided to make accessible to the public, with effect from the opening of the oral proceedings, copies of the written pleadings and of the documents annexed thereto. At the hearings questions were put by the Chamber, to which replies were given in writing pursuant to Article 61, paragraph 4, of the Rules of Court. Each Party submitted its written comments on the other's written replies in accordance with Article 72 of the Rules of Court. (2) that sovereignty over all of the islands in the River [Niger], and in particular the island of Léte, lies with the Republic of Benin." (2) that sovereignty over all of the islands in the River [Niger], and in particular the island of Lété, lies with the Republic of Benin." � the second part of the line joins this latter point to the point where the former boundary between the cercles of Say and Fada meets the former boundary between the cerdes of Fada and Atacora, indicative co-ordinates of which are as follows; latitude: 11�44'37" North; longitude: 2� 18'55" East." � the second part of the line joins this, latter point to the point where the former boundary between the cerdes of Say and Fada meets the former boundary between the cerdes of Fada and Atacora, indicative co-ordinates of which are as follows: latitude; 11�44'37" North; longitude: 2� 18'55" East." � the second part of the line joins this latter point to the point where the former boundary between the cercles of Say and Fada meets the former boundary between the cercies of Fada and Atacora, indicative co-ordinates of which are as follows; latitude: 11� 44'37" North, longitude: 2� 18'55" East." (1) The boundary between the Republic of Benin and the Republic of Niger follows the line of deepest soundings in the River Niger, in so far as that line could be established at the date of independence, from the point having co-ordinates latitude 12� 24'27" North, longitude 2� 49' 36" East, as far as the point having co-ordinates latitude 11� 41' 40.7" North, longitude 3�36'44" East. (2) That line determines which islands belong to each Party. � The islands between the line of deepest soundings and the right bank of the river, namely Pekinga, Tondi Kwaria Barou, Koki Barou, Sandi Tounga Barou, Gandégabi Barou Kaïna, Dan Koré Guirawa, Barou Elhadji Dan Djoda, Round ou Barou and Elhadji Cha'ibou Barou Kaïna, belong to the Republic of Benin. � The islands located between the line of deepest soundings and the left bank of the river, namely Boutnba Barou Béri, Boumba Barou Kaïna, Kouassi Barou, Sansan Goungou, Lété Goungou, Mon-boye Tounga Barou, Sini Goungou, Lama Barou, Kotcha Barou, Gagno Goungou, Rata Goungou, Gandégabi Barou Béri, Guirawa Barou, Elhadji Chaïbou Barou Béri, G�ussou Barou, Bey� Barou and Dole Barou, belong to the Republic of Niger. (3) The attribution of islands to the Republic of Benin and the Republic of Niger according to the line of deepest soundings as determined at the date of independence shall be regarded as final. (4) With regard to the Gaya-Malanville bridges, the boundary passes through the middle of each of those structures. �the second part of the line joins this latter point to the point where the former boundary between the cercles of Say and Fad a meets the former boundary between the cercles of Fad a and Atacora, indicative co-ordinates of which are as follows: latitude: 11�44'37" North; longitude: 2� 18'55" East." 17. The task assigned to the Chamber in the present case by the Special Agreement of 15 June 2001 is to determine the course of the whole boundary between Benin and Niger and to specify to which State each of the islands in the River Niger sector belongs, and in particular the island of Lété. 18. Article 2 of the Special Agreement divides the disputed boundary into two sectors: the River Mekrou sector in the west and the River Niger sector in the east. Sketch-map No. 2, on page 106 below, gives a general view of this boundary. The western part of this boundary follows a course running approximately south-west to north-east, passing through woodland composed of transitional Sudano-Sahelian vegetation, from a point marking the boundary between the two States and Burkina Faso as far as the confluence of the River Mekrou and the River Niger. The eastern part of the boundary follows the River Niger in a southeasterly direction over a distance of some 150 km from that confluence and ends at a point marking the boundary of the two States with Nigeria, The Parties have submitted differing descriptions of the characteristics of the River Niger in the region. According to Benin, the river is subject to siltation, which has led to a change in its course over time particularly affecting the right bank, which is much less stable than the left bank. Although it acknowledges the existence of this phenomenon, Niger maintains that, because of the nature of the rocks in the stretch of river concerned, there has been no significant change in the course of The main channel for more than a century* and that there is no substantial difference in the configuration of each bank. In this sector, three tributaries (the Mekrou, the Alibori and the Sola) enter the River Niger from the right bank, as a result of which it floods twice a year, in January-March and. in September-October. The Parties have conflicting views as to whether, in the area subject to delimitation, the river is navigable during the low-water season: Benin claims that it is not but Niger maintains that navigation is possible throughout the year for certain types of craft. 19. There are several islands within the stretch concerned; their exact number and. their attribution to either Party are matters of dispute in the present case. Sketch-Map No. 2. General View of the Boundary Region Between the Parties. the island are: upstream, 12�9'55" latitude North and 3�6'47" longitude East; downstream, 12� 3'43" latitude North and 3� 13' 39" longitude East. The island is fertile, with rich pastures, and is permanently inhabited; according to information supplied by Niger, its population numbered some 2,000 in the year 2000. 20. The frontier dispute between the Parties is set within a historical context marked by the accession to independence of the territories that were formerly part of French West Africa ("Afrique occidentale française", hereinafter "AOF"). Benin, which has been independent since 1 August 1960, corresponds to the former colony of Dahomey, and Niger, which has been independent since 3 August 1960, corresponds to a territory which underwent various administrative transformations during the colonial period. 21. In their written pleadings, both Parties referred to incidents that occurred on the island of Lé té on the eve of their independence, in 1959 and 1960. Following those events, the two States set up a process for the friendly settlement of their frontier dispute: in 1961 and 1963 two Daho-mey-Niger joint commissions met to discuss the matter. In October 1963 the crisis between Dahomey and Niger deepened, in particular regarding the island of Lété. Each State subsequently published a White Paper setting out, inter alia, their respective positions regarding the frontier dispute. There were fresh attempts to reach a peaceful settlement in the years that followed, culminating in a conference held in Yamoussoukro on 18 January 1965, in the course of which the Parties agreed "until the dispute over the island is finally settled, to allow nationals of both countries to live in perfect harmony on that island". However, the issue of sovereignty over the island of Lété was not resolved and there were further incidents in subsequent years, notably in 1993 and 1998. 22. On 8 April 1994 Benin and Niger entered into an agreement creating a joint commission for the delimitation of their common border, whose terms of reference included the enumeration, collection and analysis of documents relating to the frontier and the precise establishment thereof. The commission held six meetings between September 1995 and June 2000. Since efforts to arrive at a negotiated solution to the dispute were unsuccessful, the commission proposed that the Governments of the two States bring the dispute before the International Court of Justice by Special Agreement. The Special Agreement was signed in Cotonou on 15 June 2001 and entered into force on 11 April 2002. 23. Under Article 6 of the Special Agreement ("Applicable Law"), the rules and principles of international law applicable to the present dispute include "the principle of State succession to the boundaries inherited from colonization, that is to say, the intangibility of those boundaries". It follows from the wording of this provision and from the arguments of the Parties that they are in agreement on the relevance of the principle of uti possidetis juris for the purposes of determining their common border. As the Chamber formed in the case concerning the frontier Dispute (Burkina Faso/Republic of Mali) had occasion to state, the existence of this principle has been recognized on several occasions in the African context (Frontier Dispute (Burkina Faso/Republic of Mali), Judgment, T.C.J. Reports 1986, p. 565, para. 20); it was recognized again recently, in Article 4 (b) of the Constitutive Act of the African Union, of which Benin and Niger are members, signed in Lomé on 11 July 2000, That Chamber stated that, according to the principle in question, "pre-eminence [is] accorded to legal title over effective possession as a basis of sovereignty'' and that its essence lies "in its primary aim of securing respect for the territorial boundaries at the moment when independence is achieved", including former administrative delimitations established during the colonial period that became international frontiers (I.C.J. Reports 1986, pp. 586-587, para. 63, and p. 566, para. 23). 24. On the basis of the principle of uti possidetis juris, the present Chamber must thus seek to determine, in the case before it, the boundary that was inherited from the French administration. The Parties agree that the dates to be taken into account for this purpose are those of their respective independence, namely 1 and 3 August 1960; the Chamber would observe that there was no change in the frontier between these two very close dates. 25. The Parties have nonetheless sometimes expressed differing opinions regarding certain aspects of the application of the uti possidetis juris principle in the present case. Firstly, Niger maintains that this principle does not preclude the Chamber from taking account, where appropriate, of the physical realities subsequent to independence, in order to ensure that the Judgment will have meaningful and practical significance between the Parties. Consequently, in requesting the Chamber to indicate to which State each of the islands in the River Niger belongs, by reference to the line of deepest soundings at the date of independence. Niger asks it to consider for this purpose only those islands that exist at the present time. Benin, for its part, argues that, if the uti possidetis juris principle is to be applied strictly, it would be unacceptable to refer to the present situation in order to determine to which Party the islands belonged at the date of independence. The Chamber observes that, in any event, the Parties agree that the course of their common boundary should be determined, in accordance with the uii possidetis juris principle, by reference to the physical situa-[p109]tion to which French colonial law was applied, as that situation existed at the dates of independence. However, the consequences of such a course on the ground, particularly with regard to the question of to which Party the islands in the River Niger belong, must be assessed in relation to present-day physical realities and, in carrying out the task assigned to it under Article 2 of the Special Agreement, the Chamber cannot disregard the possible appearance or disappearance of certain islands in the stretch concerned. 26. Secondly, Benin and Niger have put forward differing views with respect to the documents or maps on which the Chamber should base its determination of their common boundary. In support of its delimitation claims, Niger relies on certain documents and maps that are posterior to the dates of independence, not only to demonstrate current physical realities but also to establish the situation existing in the colonial era. According to Niger, that situation must be determined on the basis of the studies conducted closest in time to the Parties' accession to independence, without being confined to those conducted prior to the dates of independence. Benin considers, to the contrary, that the Chamber should base its decision on research and documents prior to the critical date. The Chamber cannot exclude a priori the possibility that maps, research or other documents subsequent to that date may be relevant in order to establish, in application of the uti possidetis juris principle, the situation that existed at the time. In any event, since the effect of the uti possidetis principle is to freeze the territorial title (Frontier Dispute (Burkina Faso/Republic of Mali), Judgment, I.C.J. Reports 1986, p. 568, para. 29), the examination of documents posterior to independence cannot lead to any modification of the "photograph of the territory" at the critical date unless, of course, such documents clearly express the Parties'' agreement to such a change. 27. Thirdly, the Parties have discussed the legal value, in the light of the uti, possidetis juris principle, of post-colonial effect ivites. The Chamber notes that both Parties have on occasion sought to confirm the legal title which they claim by relying on acts whereby their authorities allegedly exercised sovereignty over the disputed territories after 1960; such effeclivites have been invoked by Niger inter alia in respect of activities relating to the River Niger and its islands, and by Benin in respect of activities relating to the right bank of the River Mekrou. "have regard ... in certain instances, to documentary evidence of post-independence effect ivites when . . . they afford indications in [p110] respect of the . . . uti possidetis juris boundary, providing a relationship exists between the effectivites concerned and the determination of that boundary" (Judgment, I.C.J. Reports 1992, p. 399, para, 62). 28. The Parties both acknowledge that, in accordance with the principle of uti possidetis juris, the course of the frontier and the attribution of islands in the River Niger to either one of them must be determined in the light of French colonial law, known as "droit d'outre-mer". They also agree on the identification of the relevant rules of that law, but do not share the same interpretation thereof. "not in itself (as if there were a sort of continuum juris, a legal relay between such law and international law), but only as one factual element among others, or as evidence indicative of . . . the 'colonial heritage' " (Frontier Dispute (Burkina Faso/Republic of Mali), Judgment, I.C.J. Reports 1986, p. 568, para. 30). 29. As the Chamber in the case concerning the Frontier Dispute (Burkina Faso/Republic of Mali) (I.C.J. Reports 1986, pp. 568-569, para, 31) already observed, the territorial administration of the French possessions in West Africa was centralized by a decree of the President of the French Republic of 16 June 1895 and placed under the authority of a Governor-General. The entity of the AOF thus created was divided into colonies, headed by Lieutenant-Governors and themselves made up of basic units called "cercles� which were administered by commandants de terete; each cercle was in turn composed of subdivisions, each administered by a chef de subdivision. The subdivisions consisted of cantons, which grouped, together a number of villages. 30. The Parties acknowledge that the creation and abolition of colonies fell within the jurisdiction of the authorities of metropolitan France: the President of the French Republic, acting by decree, under the Constitution of the Third Republic, and subsequently the French Parliament, following the adoption of the Constitution of 27 October 1946. The power to create territorial subdivisions within a single colony, on the other hand, was vested in the AOF until being transferred to the local representative institutions in 1957. Article 5 of the decree of the President of the French Republic, dated 18 October 1904, providing for the reorganization of the AOF, vested the Governor-General with authority to "determine in government council (conseil de gouvernement), and on the proposal of the Lieutenant-Governors concerned, the administrative districts in each of the colonies". In his circular No. 114c of 3 November 1912, concerning the form of [p111] instruments for the organization of administrative districts and subdivisions, the Governor-General interpreted this text as conferring upon him "the right to establish . . , the number and extent of the cercles which, within the colonies, constitute[d] the actual administrative unit", but pointed out that it was "acknowledged that the Lieutenant-Governors would retain the power to determine the territorial subdivisions created within these cercles by measures adopted under their own authority". According to that circular, "any measure concerning the administrative district, the territorial unit proper, i.e. affecting the cercle, in terms of its existence (creation or abolition), its extent, its name, or the location of its administrative centre", was to be confirmed by an arrêté général adopted in government council; it lay with the Lieutenant-Governors "to define, by means of arrêtés, the approval of which [was] reserved to [the Governor-General], the exact and detailed topographical boundaries of each of these districts", as well as "within the cercles, [to] fix . , . the number and extent of The territorial subdivisions . . . and the location of their centre" by means of local decisions. 31. Benin submits that, in the light of these texts, the rules applicable to the creation of colonies and their subdivisions should be distinguished from those relating to the establishment of territorial boundaries. At the hearings, Benin nevertheless acknowledged that the principle whereby authorities empowered to create colonies or administrative districts were also competent to define or modify the boundaries thereof was certainly applicable to colonies. However, Benin contended that such competence was not exclusive and that in all likelihood the said principle did not apply in respect of the internal boundaries within colonies. In any event, the local authorities, headed by the Lieutenant-Governors, had authority, by virtue of the rules governing the fixing of territorial boundaries, to clarify central authorities'' decisions. Niger, on the other hand, contends that the power to create colonies, as conferred by the above-mentioned texts, entailed the implicit power to establish their overall extent, from which boundaries of varying precision could be determined on a case-by-case basis. According to Niger, it followed from this that the rules concerning the creation and organization of colonial administrative districts gave implicit prerogatives to the French metropolitan authorities for the determination of in ter-territorial boundaries, and to the authorities of the AOF for the delimitation of administrative districts and their subdivisions. The Lieutenant-Governors' competence in this matter was confined to certain specific circumstances, according to a procedure and formalities laid down by the above-mentioned texts. 32. For a better understanding of the historical context in which the Parties' claims stand in relation to the determination of the frontier and [p112] to the question of to whom the islands in the River Niger belong, the evolution of the legal status of the territories concerned during the colonial period should be briefly recapitulated. 33. In the second half of the nineteenth century, France initially established settlements along the coast of Dahomey, at Cotonou and Porto Novo. Following an armed conflict with the local chieftain in the 1880s and 1890s, it consolidated its presence in the region first by placing Dahomey under protectorate (1892), and then by creating the "colony of Dahomey and dependencies" (decree of 22 June 1894). France subsequently launched expeditions northwards from its possessions in Dahomey, as well as southwards and eastwards from Sudan, which enabled it, in the autumn of 1897, to occupy the valley of the River Niger (in particular the sector between Say and Boussa). The French occupation was expressly formalized, as regards the region of north-western Dahomey, by a convention concluded with Germany on 23 July 1897, and as regards north-eastern Dahomey, by a convention concluded with Great Britain on 14 June 1898. By means of a convention of 8 April 1904, certain adjustments were made to the line established in 1898 in order to separate the French and British areas of influence. The parties to that convention fixed the boundaries of their respective possessions in accordance with those adjustments by means of a convention of 29 May 1906 in respect of the region to the east of the River Niger, and by means of an agreement of 19 October 1906 in respect of the territories between the Gulf of Guinea and that river; demarcation operations, documented in an official record dated 19 February 1910, were subsequently carried out by the Anglo-French Commission for the delimitation of the territories situated between the Niger and Lake Chad. 34. At the end of the nineteenth century, when the colony of Dahomey was incorporated into the AOF by decree of 17 October 1899, it encompassed, in the region concerned by the present dispute, territories situated on both banks of the River Niger. By virtue of the same decree, which had provided for the dissolution of French Sudan and the apportionment of the territories it had comprised among different colonies and two specially created military territories, (he territory of Say was also attributed to Dahomey. This territorial incorporation was put into effect by an arrêté of the Governor of Dahomey dated 20 March 1901. By arrêté of 23 July 1900, the Governor-General of the AOF decided to establish a third military territory encompassing the regions on the left bank of the River Niger from Say to Lake Chad. That 1900 arrêté was followed by a decree of the President of the French Republic dated 20 December 1900 with the same object. The boundary between the Third Military Territory and the First Military Territory created in 1899 was subsequently determined by an arrêté of the Governor-General of the AOF, dated 20 March 1902. By a decree of 18 October 1904 on the reorganization of the General Government of the AOF, the President: of the French Republic inter alia established the colony of Haut-Sénégal et Niger comprising "the former [p113] territories of Haut-Sénégal and Moyen-Niger and those which form[ed] the Third Military Territory". The newly created colony was composed of "cercles under civil administration" as well as the "Military Territory of Niger", constituted by the former First and Third Military Territories. By decree of 2 March 1907, the cercles of Fada-N'Gourma and Say were detached from Dahomey and incorporated into the colony of Haut-Sénégal et Niger. The intercolonial boundary fixed by that decree was revised on two occasions in its western part, first by a decree of 12 August 1909, and subsequently by a decree of 23 April 1913. 35. On 7 September 191.1, a further decree separated the Military Territory of Niger from the colony of Haut-Sénégal et Niger (the cercle of Say remaining as a district of that colony), in order to make it an administrative subdivision under the direct control of the office of The Govern-ment-General of the AOF. On 1 January 1921, that military territory became the Civil Territory of Niger, and was then made an autonomous colony by decree of 13 October 1922. By decree of 28 December 1926, certain cantons in the cercle of Dori and the cercle of Say (with the exception of the canton of Gourmanché-de-Botou) were detached from Haute-Volta and incorporated into Niger. An arrêté general of 31 August 1927 and the erratum thereto of 5 October of the same year determined the boundary between the colonies of Haute-Volta and Niger. The colony of Haute-Volta was abolished by decree of 5 September 1932, then reconstituted with the same territorial basis by Law No. 47-1707 of 4 September 1947; in the intervening period, the cercles of Fada and Dori (excluding the canton of Aribinda) were incorporated into Niger. 36. During the colonial period, the administrative organization of Dahomey and Niger wag the subject of several successive enactments. Following its establishment in 1894, the colony of Dahomey and dependencies was organized by arrêté of the Governor ad interim, dated 11 August 1898; that arrêté established four cercles in the colony, including that of Moyen-Niger, which comprised inter alia "the territories of Zaberma or Dendi situated on either side of the Niger and their dependencies" and that of Gourma, which comprised "the provinces of Fada N'Gourma, Parna, Matiacouali, Kodjar, Botou and their dependencies". The territorial divisions of the colony were reorganized by arrêtés of the Governor-Genera] of the AOF, dated 8 December 1934 and 27 October 1938; those two arrêtés inter alia defined the boundaries of the cercles of Kandi and of Natitingou, adjoining the colony of Niger. The internal reorganization of Niger was the subject of successive arrêtés of the Govern or-General of the AOF, dated 26 December 1904, [p114] 31 December 1907, 14 December 1908, 22 June 1910, 23 November 1912 aud 22 January 1927. On the eve of independence, as a result of an arrêté général of 30 March 1956 adding seven new cercles to the colony, Niger comprised 16 cercles. 37. The Chamber will now describe the main documents relevant to the settlement of the frontier dispute. In this connection, a distinction should be made between those documents that concern the determination of the course of the boundary in the River Niger sector and the question of to whom the islands in that river belong and those documents that relate to the delimitation in the River Mekrou sector. [i]n the north-east, by the course of the Niger to its confluence with the Mekrou . . .". � letter No. 3722/APA of 27 August 1954, by which Secretary-General Ray nier, Governor ad interim of Niger, informed the chef aï the subdivision of Gaya (Niger), through the commandant of the cercle of Do s so (Niger), "that the boundary of the Territory of Niger [was] constituted by the line of highest water, on the left bank of the river, from the village of Bandofay to the frontier of Nigeria" and that "[consequently, all the islands situated in this part of the river [formed] part of the Territory of Dahomey". The Parties have drawn the attention of the Chamber to other letters relating to the intercolonial boundary exchanged between the authorities of Niger, between the authorities of Dahomey and between the two colonies during 1954, as well as in subsequent years (in 1956 for example), which would allegedly make it possible to assess the legal value and the significance of the aforementioned letter. [i]n the South-East, by the Mekrou from that point as far as its confluence with the Niger". � arrêté general No. 4676 SE/F of 25 June 1953, creating the "Niger W Total Game Reserve" in an area situated in the cercle of Niamey (Niger), the boundaries of which it fixed. �the Agreement of 14 January 1999 between Niger and Benin, relating to the development of a hydroelectric facility at Dyodyonga on the River Mekrou. 40. The Parties also produced a large quantity of cartographic and photographic material in support of their respective arguments, varying in date, origin, technical quality and level of accuracy. 41. With regard to the identification of the main channel of the River Niger and the attribution of the islands in that river between the Parties, Niger has relied in particular on the following, among many other maps and sketch-maps; maps of the course of the Niger prepared in 1896 following a mission led by Lieutenant Commander Hourst to study the régime of the river and its navigability; The general 1 :10,000 plan from the study on the navigability of the stretch of the Niger between Niamey and Gaya carried out by the mission led by A. Beneyton in 1929-1930; the map annexed to the report on the survey of the river between Niamey and Malanville carried out in 1949 on the instructions of the chef des services of the Benin-Niger region; sheet No. 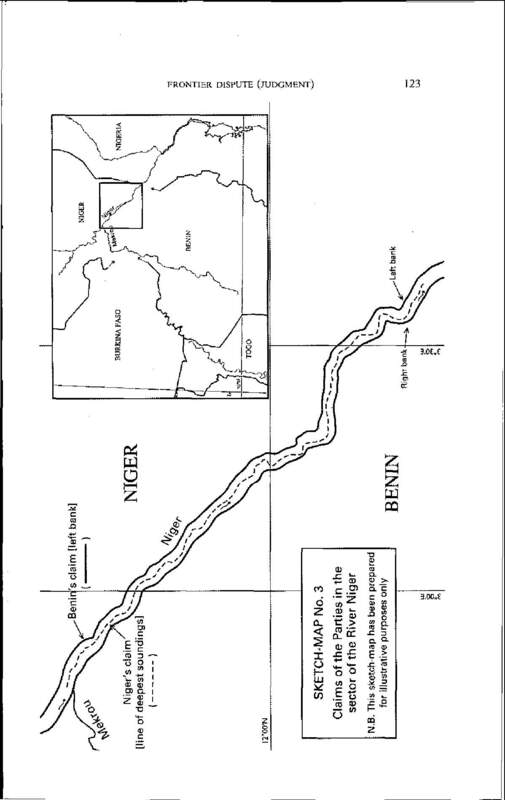 4 of the study on the navi-gability of the river (1:10,000 survey of the shoals) prepared in 1965 by the topographic service and land registry of the Republic of Niger; maps Nos. 32 to 37 on a scale of 1:50,000 from the study on the navigability of [p118] the River Niger between Tossaye and Yelwa conducted from 1967 onwards by NEDECO, a Dutch firm, at the request of four riparian States (Dahomey, Mali, Niger and Nigeria), the work on the ground being carried out in 1968-1969 and the final report produced in September 1970; and sheets Nos. 1 to 4 on a scale of 1:50,000 from the study of the River Niger in 1979 by the French Institut géographique national (IGN) on the basis of a photographic mission in April 1975. Niger also pointed out that the 1:200,000 maps of West Africa published by the AOF cartographic service in Dakar in 1955 and I960 situated the intercolonial boundary in the course of the river. For its part, Benin has referred to cartographic material dating from the colonial period, produced by one or other of the Parties, to demonstrate that the cartographers never took it for granted that the boundary between the colonies of Dahomey and Niger followed the navigable channel of the River Niger. Moreover, according to Benin, the above-mentioned sketch-maps or studies, relied on by Niger in support of its argument, cannot be used to define the navigable channel at the dates of independence or to determine to which of the Parties the islands in the river belong. Finally, Benin relies on a study carried out for the purposes of the present case by IGN-France international in December 2003, which compared the maps of the region published by IGN in 1960 with SPOT images on the same scale recorded in 2002, in order to show the changes in the configuration of the widest channel and islands of the River Niger over the last 50 years. 42. With regard to the River Mekrou sector, each Party has relied on several maps dating from the colonial period to support its position. According to Benin, these maps (in particular those prepared after 1919, with the exception of a map dated 1922 and republished in 1928 cited by Niger) confirm that the Mekrou was the intercolonial boundary. Benin refers, inter alia, to the following cartographic documentation; the "Kandi" and "Niamey" sheets of the map (1:500,000) prepared and published in October 1926 by the AOF Geographical Service (known as the "Blondel la Rougery map"); the map entitled "New Boundary of Haute-Volta and Niger (according to the erratum of 5 October 1927 to the arrêté of 31 August 1927)" (1:1,000,000); an undated map entitled "Sketch-map of the Colony of Niger prepared by Colonel Abadie of the Colonial Infantry" (1 : 4,500,000); a Dahomey-Togo road map (1:1,000,000) prepared by the AOF Geographical Service in 1938; and a road sketch-map entitled "Dahomey and Togo" prepared by the same service in 1948. Niger has relied on a large amount of cartographic material to show that the colonial authorities had only a vague knowledge of the River Mekrou region and of the exact course of that river, and that the boundary established by the decree of 2 March 1907 had never been challenged; in this connection, it drew the attention of the Chamber to a combined [p119] political and administrative map of the AOF published in 1928 (the updated version of a similar map prepared in 1922) on which the dates of 2 March 1907 and 6 September 1909 are placed along the line marking the boundary in the Mekrou sector. 43. Finally, the Parties refer to certain maps in order to determine the indicative co-ordinates of precise points on their common frontier. Thus Benin measures the co-ordinates of the tripoints with Burkina Faso and Nigeria on the basis of the relevant sheets of what it regards as the most reliable map published on the eve of the independence of the two States, namely a 1:200,000 map of the AOF produced by the IGN in 1955. Niger has noted that the co-ordinates of the Benin/Niger bipoint and of the tripoint with Burkina Faso that it claims in the River Mekrou sector were plotted on 1:200,000 IGN maps (the Kandi sheet of a map of West Africa published by the IGN which is annexed to its Memorial). This principle will also guide the Chamber in its assessment of the maps relied on by the Parties in the present case. 45. The Chamber is firstly asked, in accordance with Article 2, paragraphs (a) and (b), of the Special Agreement, to determine the course of the boundary in the sector of the River Niger and then to specify to which Party each of the islands in the river belongs. As the Chamber has recalled (see paragraph 23 above), the Parties have expressly asked it to carry out its task on the basis of, in particular, the principle of the succession of States to the frontiers inherited from colonialism, namely the principle of the intangibility of such frontiers, also known as the principle of uti possidetis juris. 46. In the present case these territorial boundaries were no more than delimitations between different administrative divisions or colonies subject to the same colonial authority. Only at the moment of independence, also called the "critical date", did these boundaries become international frontiers. Until that time the matter of delimitation was governed by French colonial law, known as "droit d'outre-mer". As noted above (see paragraph 28), in the application of the principle of uti possidetis juris, French law does not play a role in itself but only as one factual element among others, or as evidence indicative of what has been called the "colonial heritage" at the critical date. Since the Parties achieved independence virtually simultaneously (see paragraph 20 above), the period between 1 and 3 August 1960 can be considered as the critical date. 47. In accordance with the approach of the Chamber in the Frontier Dispute (Burkina Faso/ Republic of Mali) case, the Chamber will first consider the various regulative or administrative acts invoked by the Parties; thus, pre-eminence is to be accorded to legal title over effective possession as a basis of sovereignty (I.C.J. Reports 1986, pp. 586-587, para, 63). In this respect, it is relevant to recall that the Parties agree that, during the period under consideration, the power to create colonies or territories was vested in the President of the French Republic until 1946 and thereafter in the French Parliament, while colonial subdivisions could be created by the Govern or-General of the AOF under the terms of the decree of 18 October 1904. In his circular No. 114c of 3 November 1912, the Governor-General of the AOF determined that the main subdivisions ("cercles") would be established by the Governor-General, but that the Lieutenant-Governors would be entitled to create further territorial subdivisions within the "cercles" (see paragraph 30 above). It appears that it is not disputed between the Parties that the competence to create or establish territorial entities included the power to deter-[p121]mine their extent and to delimit them, although during the colonial period this was never made explicit in any regulative or administrative act. 48. As the Chamber has set out above (see paragraphs 32 to 36), the colony of Dahomey was created by decree of 22 June 1894 and incorporated into the AOF by decree of 17 October 1899. It is not contested that, during this period, the colony of Dahomey comprised territories situated on both banks of the River Niger. 49. By arrêté of 23 July 1900 the Governor-General of the AOF established a Third Military Territory, which "will encompass the areas on the left bank of the Niger between Say and Lake Chad that were placed within the French sphere of influence by the [Anglo-French] Convention of 14 June 1898". 50. On 20 December 1900 a decree of the President of the French Republic was issued which established a Third Military Territory "between the Niger and Lake Chad". The decree, which was superior to an arrêté in the hierarchy of legal acts, made no reference to the arrêté of 23 July 1900. En the Chamber's view, the decree must nevertheless be seen as a confirmation of the arrêté of the Governor-General, it covers, albeit in less precise terms, the same area between (the River) Niger and (Lake) Chad. 51. Benin contends that the arrêté of 23 July 1900 established the boundary between the Third Military Territory and the colony of Dahomey at the left bank of the River Niger. According to Benin, by detaching the areas beyond the left bank from Dahomey, the river itself and the islands located therein remained part of that colony. Benin further contends that the boundary thus established was confirmed in 1954 by Mr. Raynier, Secretary-General and Governor ad interim of Niger, in his letter of 27 August (see paragraph 38 above). Sketch-map No. 3, on page 123 below, shows the claims of the Parties in respect of the boundary in the sector of the River Niger. 53. The Chamber is of the view that the arrêté, of 23 July 1900 in conjunction with the decree of 20 December 1900, which created the Third Military Territory, cannot be read as determining the boundaries thereof. The geographical references used can only be seen as indicating in general terms the extent of the newly created territory; the words "the areas on the left bank of the Niger" in the arrêté and "the Niger" in the decree make it clear that these areas are detached from the colony of Dahomey to which they previously belonged. 54. The conclusion that the legal instruments of 23 July and 20 December 1900 did not determine any boundary, and were not considered at the time as doing so, is confirmed by the letter of 7 September 1901 of the French Minister for the Colonies addressed to the Governor-General of the AOF. In this letter reference is made to two political reports in which the Governor of Dahomey indicated with regard to the delimitation between Dahomey and the Third Military Territory that "the course of the Niger" would constitute the best demarcation line, both from a geographical and a political point of view. The Governor-General apparently supported this suggestion and in his reply the Minister wrote that he "share[d] [the] view [of the Governor-General] on this point". 55. Although this letter did not determine the boundary, the Chamber considers that it provides sufficient evidence that a delimitation had not taken place the year before. Nor has the Chamber found any document which shows that a delimitation was carried out in subsequent years. The Chamber notes in this respect that a preparatory draft of the arrêté général of 23 November 1912 on the internal administrative reorganization of the Military Territory of Niger contained a suggestion to locate the boundary at the right bank of the River Niger, thus allocating all islands in the river to this Territory, but that this proposal was not followed in the arrêté itself which did not contain any delimitation clause. 56. The Chamber therefore concludes that Benin's argument that the arrêté of 23 July 1900 located the boundary at the left bank of the River Niger, and that this delimitation remained in force until the date of independence, cannot be upheld. Sketch-Map No. 3. Claims of the Parties in the Sector of the River Niger. line of highest water, on the left bank of the river, from the village of Bandofay to the frontier of Nigeria", and that "[consequently, all the islands situated in this part of the river [formed] part of the territory of Dahomey". 58. According to Benin, this letter both corroborates the existence of the boundary at the left bank and adds the further precision that it is constituted by "the line of highest water". Benin argues that this was not beyond the competence of a Lieutenant-Governor; the letter must be deemed to be declaratory in so far as it confirmed and clarified an already existing title and constitutive in so far as it contained a specification of that title. 59. Benin further contends that Niger is bound by the letter since it subsequently became the subject of intercolonial correspondence and was relied upon by the authorities of Dahomey. The letter was never withdrawn by its author nor was it invalidated by a higher authority. In Benin's view, "for the purposes of applying the uti possidetis principle, it is thus indeed the 1954 correspondence which constitutes the 'colonial heritage', that is to say, the 'photograph' of the territory at the critical date". 60. Niger denies that Mr. Raynier was competent to determine an intercolonial boundary and consequently considers that the letter lacks any legal basis. It further contends that the letter only refers to one section of the limit (between Bandofay and the border with Nigeria) and therefore cannot determine the whole boundary. Niger finally asserts that the letter was of an intra-colonial character and never led to an intercolonial understanding to which it could be held in good faith. 61. The Chamber will first analyse the context in which the letter of 27 August 1954 was written. From the case file it is clear that in the first half of 1954 difficulties had arisen between the local authorities in the two colonies about the legal status of certain islands in the river. With regard to one of these islands, ("the island opposite Gaya"), the commandant of the cercle of Kandi (Dahomey) sent a letter dated 17 June 1954 to the Governor of Dahomey asking to whom that island belonged. On 23 July of the same year the chef of the subdivision of Gaya (Niger) addressed a more general request to the Governor of Niger, asking for "all relevant information regarding the islands in the river belonging to Niger or to Dahomey". 62. In his response of I July 1954 to the first letter, the Governor of Dahomey stated that "the arrêtés delimiting the boundary between these two territories [were] silent" on the question of the attribution of the islands to each colony. He requested the commandant of the cercle of Kandi to draw up a list of those islands, the status of which could be the source of dispute, "in order to enable [him] to settle once and for all with [p125] Niger, [with whom he intended to raise] the question, this problem of the boundary delimitation". 63. In his reply, dated 27 August 1954, to the request made by the chef of the subdivision of Gaya, Mr. Raynier, the Governor ad interim of Niger (who had arrived in Niamey on 25 August 1954), made the statement referred to above (see paragraph 57). No reasoning was given nor were any references made to earlier regulative or administrative acts. The commandant of the cercle of Dosso (to which Gaya belonged) sent a copy of this letter to the commandant of the cercle of Kandi, who in turn transmitted it to the Governor of Dahomey. 64. On 11 December 1954 the Governor of Dahomey asked his counterpart in Niger "to kindly provide [him] with particulars of the instruments or agreements determining [the] boundaries" mentioned in the letter of 27 August. The Governor stated that he sought this clarification "in order that this question might be officially resolved" since "Dahomey's archives and arrêté general No. 3578/AP of 27 October 1938 providefd] no specific information on the matter". The Governor ad interim of Niger never responded to that request. 65. The Chamber has already found that the arrêté of 23 July 1900 did not establish a boundary; consequently, the letter of 27 August 1954 cannot be seen as an authoritative confirmation of such a boundary. The Chamber further notes that, under French colonial law, the Lieutenant-Governor of a colony had no competence to unilaterally delimit the external boundaries of the colony. The letter in itself cannot, therefore, be relied on by Benin as a legal title placing the boundary on the left bank of the river. 66. The boundary defined in the letter could have been validated by a higher authority and it was with that in mind that the Governor of Dahomey asked for further information in his letter of 11 December 1954. However, the letter of 11 December S954 went unanswered. Moreover, no further action was taken by either of the two colonies in order to have the boundary indicated in the letter of 27 August 1954 validated by the Govern or-General of the AOF. The Chamber therefore cannot uphold Benin's claim according to which the letter of 27 August 1954 in conjunction with the arrêté of 23 July 1900 provides it with legal title to a boundary on the left bank. 67. With regard to Benin's contention that the letter led to some sort of informal intercolonial understanding which bound Niger at the critical date in 1960, the Chamber observes that such a legal concept did not exist in French colonial law or "droit d'outre-mer" thus cannot provide Benin with title. The Chamber is, however, aware of the fact that the letter of 27 August [p126] 1954 may have led to certain effectivités. Whether or not this is the case will be considered in due course. 68. The Chamber will now turn to the acts invoked by Niger as evidence of its legal title, namely the arrêtés issued by the Governor-General of the AOF on 8 December 1934 and 27 October 1938 reorganizing the internal administrative structure of the colony of Dahomey and containing a description of the boundaries of the various cercles. In both arrêtés the north-west boundary of the cercle of Kandi is described as "the course of the Niger as far as its confluence with the Mekrou". 69. According to Niger these arrêtés are the formal and authoritative confirmation that the boundary between Dahomey and the neighbouring colony of Niger was located in the watercourse itself, as had already been indicated in the letter of the Minister for the Colonies dated 7 September 1901. The arrêtés thus provide sufficient evidence of Niger's title, even if the title itself is not explicitly laid down in a prior regulative or administrative act. 70. Benin contends that these arrêtés were merely of an intra-colonial character and were not intended to determine the boundary of Dahomey with another colony. Benin further argues that the wording used is imprecise and does not exclude a frontier on the left bank of the river. 71. The Chamber first notes that both arrêtés were issued by the Governor-General, who was the authority competent to establish, delimit and reorganize the cercles of colonies. In so far as they describe the boundaries of these cercles with the neighbouring colonies which also came under his authority, the arrêtés do not have an exclusive internal character but may also be relied upon in intercolonial relations. Consequently it can be concluded on the basis of these arrêtés that the course of the River Niger constituted the intercolonial boundary. 72. The Chamber is unable, however, to deduce therefrom that that boundary was situated in the river, whether at the thalweg or the median line. The Chamber notes in this regard that the terminology used in the arrêtés is identical to that of the 1901 letter and is just as imprecise. The notion of the "course of the river" covers a range of possibilities; a boundary on either river bank or a boundary somewhere within the river. already been in existence for a considerable period of time. In the Chamber's view, it is evident that the term, "the course of the Niger", was not intended to indicate the precise location of the boundary but merely to indicate the separation line between the two colonies. 74. The Chamber thus finds that the 1934 and 1938 arrêtés do not establish a boundary in the river; it cannot therefore sustain Niger's claims as to title. 75. In view of the foregoing, the Chamber concludes that neither of the Parties has succeeded in providing evidence of title on the basis of regulative or administrative acts during the colonial period. 76. Therefore, the Chamber will now consider whether the evidence furnished by the Parties with respect to effectivités can provide the basis for it to determine the course of the frontier in the sector of the River Niger and to which of the two States each of the islands in the river belongs, in particular the island of Lété. 77. The Chamber recalls in this regard that the Court has previously ruled in a number of cases on the legal relationship between effectivités and title. 78. Both Parties claim that, during the colonial period, administrative acts were carried out by their local colonial authorities on a number of islands in the river. The Parties mention, in this regard, the provision of licences for grazing, fishing and tree-felling, as well as the levying of taxes, periodic sanitary control of livestock, military patrolling and police activities. 79. With regard to the management of the river, Niger claims that, for a certain period, it carried out management activities over the whole of the relevant stretch of the river. Niger further maintains that, when this [p128] task was subsequently entrusted to Dahomey, the latter did not manage the whole of the river and that the colony of Niger continued to perform certain management activities on the part of the river contiguous to it. In Niger's view, its continued activities negate Dahomey's alleged rights on the whole of the river. Benin denies that such river management activities can be relied upon as effectivités since, during the colonial period, such activities, even if carried out by the authorities of individual colonies, were performed in the exercise of a public function on behalf of the AOF as a whole. 80. Aside from documentary evidence, Benin has presented testimony taken from certain individuals in the form of "summations interpellatives" (replies to official enquiries). According to Niger, such testimony, taken several decades after the period in question, is unreliable and untrustworthy. The Chamber notes that Benin did not invoke this testimony in the later stages of the proceedings. 81. Finally, both Parties have presented a number of maps in order to support their claims. Neither of them claims, however, that these maps have any "intrinsic legal force" in the sense that they represent the "physical expressions of the will of the State . . . concerned" (see Frontier Dispute (Burkina Faso/Republic of Mali), I.C.J. Reports 1986, p. 582, para, 54; see also paragraph 44 above). The Chamber notes that none of these maps were annexes to an official text. 82. The Chamber will first analyse the various activities prior to 1954, presented as effectivites by the Parties. 83. On 3 July 1914 the commandant of the secteur of Gaya (Niger), administrateur adjoint Sadoux, wrote a letter to the commandant of the cercle of Moyen-Niger (Dahomey), in which he referred to the use of certain islands by the local inhabitants of both banks of the river. He wrote this letter "for the sole purpose of clearly determining when grazing permits [should] be issued to the Peuhls from both banks and delimiting the territorial jurisdiction of the indigenous tribunals in the two colonies". Administrateur adjoint Sadoux attached to his letter a list of islands in the border area, drawn up on the basis of an exploration of the whole stretch of the river between Koulou and the Nigerian border, with an indication of the colony to which each island belonged according to its position with respect to the main navigable channel. Administrateur adjoint Sadoux defined this channel as "the river's main channel, not the widest channel, but the only channel navigable at low water" (emphasis in the original). 84. In his letter, administrateur adjoint Sadoux invited the commandant of the cercle of Moyen-Niger to come to Gaya for further discus-[p129]sions if the contents of the list were contested. The case file does not contain a reaction to the letter. However, it appears that such a meeting did take place and led to an agreement. He also mentioned that "the village of Lite" was administered by Gaya. 85. Although difficulties arose in 1919 with regard to the administration of the island of Lite by Gaya, which was contested by Dahomey, the 1914 arrangement, which became known as the 1914 modus vivendi seems to have been complied with in subsequent years. "a clearer boundary be adopted: ... the boundary between the two colonies is marked by the right bank of the river at the line of highest water. That will give all the islands to the colony of Niger without any possibility of dispute." No action was taken upon either the proposal of Dahomey or that of the commandant of the cercle of Niamey. 87. In the years prior to 1954, the island of Lete seems to have been continuously administered by the subdivision of Gaya. The tax registers of Gaya, in so far as they have been preserved, contain references to "Lété" in the years 1925, 1927, 1928, 1930, 1932, 1935 and 1936. "Lete" was included in a list of villages situated in the subdivision of Gaya, with an indication of the number of inhabitants, in 1932, 1945, 1946 and 1954. It was also included in census lists in 1944 and 1945. Finally, the Governor of Niger authorized the felling of palm trees on the island of Lété in 1946. 88. Benin has not submitted any official document from colonial authorities regarding an effective exercise of authority, during the period under consideration, on the island of Lété or on any other island situated to the left of the main navigable channel. 89. The Chamber will now turn to the effectivites in the period from 1954 until the critical date in 1960. 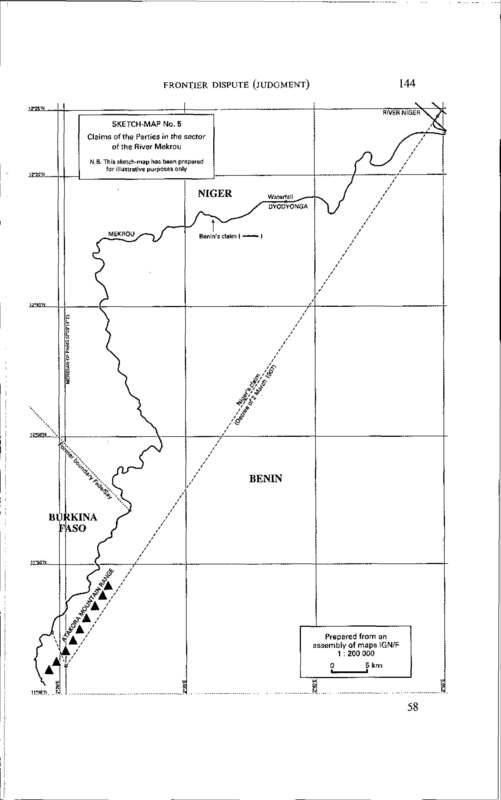 It recalls that, on 27 August 1954, the Governor ad interim of Niger wrote a letter in which he stated that the boundary was situated "at the line of highest water, on the left bank of the river, from the village of Bandofay to the frontier of Nigeria" and that "all the islands situated in this part of the river [formed] part of the territory of Dahomey". 90. During this period, the claims of Dahomey to be entitled to administer the island of Lété became more frequent. In a letter of 23 May 1955 to the commandant of the cereie of Kandi, the chef de paste admmistratif at Malanville (Dahomey) mentioned certain difficulties which had arisen with respect to the collection of taxes from inhabitants of Niger who held cattle on Lété. He raised the question of "whether the tax collector of Dahomey [was] entitled to operate on the island of Lété ". In a letter of 20 June 1955 to the commandant of the cerate of Dosso (Niger), dealing with the same incidents, the chef of the subdivision of Gaya, "without in any way wishing to raise the question of the boundary" (a clear reference to the letter of 27 August 1954), emphasized that the island of Lété "[had] consistently been regarded as belonging to Niger". 91. In 1956, difficulties arose again, this time with regard to the collection of taxes on the export of smoked fish from Lété. The commandant of the cercle of Kandi informed the Governor of Dahomey of these incidents and added that he had "rediscovered" the letter of 27 August 1954 which staled that the river and all the islands belonged to Dahomey. 92. In that same year, the Director of the Geographical Service of the AOF requested the commandants of the cercles of Dosso and Kandi to inform him of the nature and date of the official texts that defined the [p131] boundary between Dahomey and Niger. In this regard, the chef of the subdivision of Gaya informed the commandant of the cercle of Dosso that he had "rediscovered" the 1914 Sadoux letter, which he called "the only serious document on the matter". The commandant of the cercle of Kandi, by letter of 28 June 1956, informed the Director of the Geographical Service that "this question of boundaries [had], to [his] knowledge, never been dealt with in any official text". He added that there had been disputes in the past and attached in tbis regard the letter of 27 August 1954 of the Governor ad interim of Niger. 93. In 1955, 1957 and 1958, "Lété" is mentioned in the list of polling stations in Niger. 94. Serious troubles arose in 1959, the year before independence. In a letter of 16 June 1959 the chef of the subdivision of Malanville informed the Prime Minister of Dahomey (which was at the time an autonomous republic within the Communauté française) about a dispute between inhabitants of Gouroubéri (Dahomey) and Peuhls from Niger who, in violation of the property rights of the former, had occupied the island of Tété. He added that he had had unsuccessful consultations with his counterpart in Gaya, who seemed to support the Peuhls and "[was] . . . unaware of the régime governing the islands". The chef of the subdivision of Malanville was of the view that the boundary was located on the left bank of the river and stated that, according to his information, the island of Lété bad always belonged to the inhabitants of Gouroubéri. 95. In December 1959, the commandant of the cercle of Kandi visited Malanville, The chef of the subdivision of Gaya was invited to meet him on Lété but that meeting did not take place. Although the commandant of the cercle of Kandi visited the island, the chef of the subdivision of Gaya "did not come to the meeting". It was said later on that he had been unaware of the visit. 96. Riots broke out on the night of 29 June 1960, during which four Peuhls from Niger were killed and a number of dwellings were set on fire. In a letter dated 3 July 1960, the commandant of the cercle of Kandi informed the Minister for the Interior of Dahomey that order had been restored and that both Gaya (Niger) and Malanville (Dahomey) had stationed a small police unit on the island. 97. In a letter dated 13 July 1960 to the Prime Minister of Dahomey, the President of the Council of Ministers of Niger (which was also at the time an autonomous republic within the Communauté française) proposed to settle the dispute for once and for all through a formal agreement on the question of the "island of Lété (subdivision of Gaya, Niger)". In his response dated 29 July I960, the Prime Minister of Dahomey observed that the matter had already been settled by the letter of 27 August 1954 but that he did not object to consultations in order to reach a formal agreement. In a letter dated 31 July 1960, the Prime Minister of Niger again [p132] pressed for a formal settlement. He referred, however, not to the 1954 letter but, inter alia, to the 1914 letter and proposed to take as the boundary "the median line of the river's permanent channel, or of its deepest channel". 98. On the basis of the evidence before it, the Chamber finds that, from 1914 to 1954, the terms of the modus vivendi established by the 1914 Sadoux letter were in general respected and that, during this period, the main navigable channel of the River Niger was considered by both sides to be the boundary. As a result, administrative authority was exercised by Niger on the islands to the left and by Dahomey on the islands to the right of that line. The entitlement of Niger to administer the island of Lété was sporadically called into question for practical reasons but was neither legally nor factually contested. 99. With respect to the islands opposite Gaya, the Chamber notes that, on the basis of the modus vivendi established by the 1914 Sadoux letter, these islands were considered to fall under the jurisdiction of Dahomey. It recalls in this regard that in 1925 a proposal was made to Niger by the authorities of Dahomey for the exchange of the three islands opposite Gaya for the island of Lété but that no action was taken on this proposal (see paragraph 85 above). The Chamber has not received any information to indicate that these islands were administered at that time from anywhere else other than the cercle of Kandi (Dahomey). The Chamber therefore concludes that, in this sector of the river, the boundary was regarded as passing to the left of these three islands. 100. The situation is less clear in the period between 1954 and 1960. It is apparent that both Parties periodically claimed rights over the islands, in particular Lété, and also occasionally performed administrative acts as a display of authority. However, on the basis of the evidence before it, the Chamber cannot conclude that the administration of Lété, which before 1954 was undoubtedly carried out by Niger, was effectively transferred to or taken over by Dahomey. In this respect, the Chamber notes that a report of the gendarmerie of Malanville of 1 July i960 stated that Lété was "currently administered by the subdivision of Gaya". 101. Benin contends that, even if the local authorities in Niger did administer Lete and other islands during the period between 1914 and 1954, they could not have done so in the belief that they were acting "as of right". In Benin's view, the modus vivendi was merely a temporary and prac-[p133]tical arrangement, pending a definitive settlement of the boundary issue. By its very nature, it precluded the existence of an intention to act "as of right" and these administrative acts cannot therefore be relied on as effectivites. As regards the period after 1954, Benin contends that Niger had, in the letter of 27 August 1954, relinquished any intention to act "as of right". 102. The Chamber observes that the concept of the intention and will to act as sovereign, as mentioned in the Legal Status of Eastern Greenland (Denmark v. Norway) case (1933, P.C.I.J., Series A/B, No. 53, pp, 45-46), is a concept of international law and cannot be transplanted purely and simply to colonial law. The Chamber's sole task in applying the principle of uti possidetis juris is to ascertain whether it was the colony of Dahomey or that of Niger which effectively exercised authority over the areas which the Parties now claim as sovereign States. 103. For all these reasons and in the circumstances of the case, particularly in light of the evidence furnished by the Parties, the Chamber concludes that the boundary between Benin and Niger follows the main navigable channel of the River Niger as it existed at the dates of independence, it being understood that, in the vicinity of the three islands opposite Gaya, the boundary passes to the left of these islands. Consequently, Benin has title to the islands situated between the boundary thus defined and the right bank of the river and Niger has title to the islands between that boundary and the left bank of the river. 104. The Chamber will now proceed to determine the precise location of the boundary line in the main navigable channel, namely the line of deepest soundings, as it existed at the dates of independence; it will then determine to which of the Parties each of the islands in the river belongs. 105. Benin contends that the navigable channel of the River Niger is unstable and has changed over the years as the result of the siltation of the river and the formation of sandbanks of a virtually permanent character. Benin has highlighted a number of cases in which this phenomenon has allegedly resulted in a change in the position of the main navigable channel around the islands. It referred, in particular, to the islands of Kotcha Barou, Gagno Goungou and Dole Barou. 106. Niger does not deny the periodic occurrence of siltation which may lead to the formation of sandbanks but contends that, under normal circumstances, these accumulations of sand are washed away during the high-water season when the speed and pressure of the watermass increase [p134] considerably. Niger admits that, with respect to the island of Dole Barou, the main channel has moved to the left side of the island since the accession of the two States to independence, but submits that this may be due to works on dykes carried out upstream on the left bank of the river. It further submits that a number of hydrological surveys, carried out over a period of more than 60 years, have demonstrated that the riverbed is remarkably stable and that the main navigable channel has remained unchanged. 4. a series of annotated aerial photographs taken in 1975 and published in a report of IGN-Paris in 1979. 108. The Chamber observes that the position of the main navigable channel as determined by each of the missions is very similar. 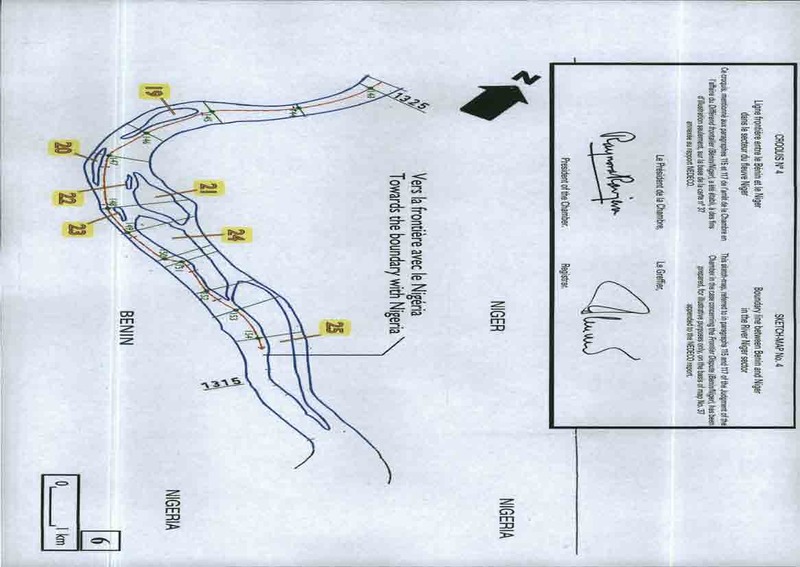 The Chamber considers that this indicates that the riverbed is relatively stable and that any siltation which has taken place has rarely led to a noticeable change in the location of the main navigable channel. This appears to have been the case in both the colonial and post-independence period. 109. Given that the Chamber has to determine the course of the boundary at the time of independence, the NEDECO report of 1970 provides the most useful information on the situation at the critical date. In view of the proven stability of the riverbed, it may be assumed that the situation between 1967 and 1970 was virtually identical with that in 1960. 110. In this respect, the Chamber considers it of great importance that the 1967-1970 survey was carried out by an independent firm renowned for its expertise and experience and that the results were contained in a report presented to the Governments of four riparian States, including the Parties to the present case. Furthermore, the findings of the NEDECO study were not contested at the lime of their publication and they are corroborated by both earlier and later studies. 111. The report of the NEDECO study examines the navigability of the River Niger between Tossaye in Mali and Yelwa in Nigeria. It there-[p135]fore covers the whole stretch of the river between Benin and Niger from its confluence with the Mekrou to the frontier with Nigeria. 112. The maps annexed to the report are very detailed, each of them covering a stretch of 25 km and showing the longitudinal profile of the main navigable channel based on the results of echosounding carried out, using a boat-mounted echo-sounder, on various occasions during the high and low water season. In order to check the position of the channel, cross-sections were made by NEDECO and the deepest point of each section was fixed. Subsequently, the distance was measured from this point to the two banks, or in certain cases to one of them. Finally, these dis-tances were represented on a topographical map on a scale of 1:50,000. The Chamber observes that the main navigable channel identified by the report of the NEDECO study generally coincides with or is very similar to the one that is represented in the maps and sketch-maps resulting from the 1896 Hourst mission and the 1926-1932 Beneyton mission. 113. The Chamber further notes that map No. 36 of the NEDECO report indicates that in the sector opposite the village of Gaya, the river has two navigable channels. On the basis of the available data, it is not possible to say which one is consistently deeper. This is however without consequence in the present case given the conclusions drawn by the Chamber, in paragraphs 99 and 103 above, from the colonial effect hues in that sector. The Chamber considers that, in the sector of the three islands opposite Gaya, the boundary is constituted by the line of deepest soundings of the left navigable channel. However, in the vicinity of the last of these islands, Kata Goungou, the boundary deviates from that line and passes to the left of that island. 114. 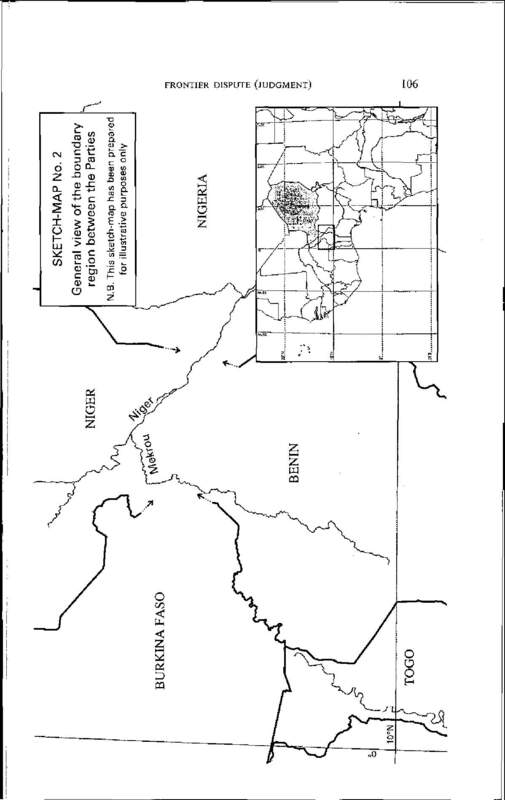 With the exception indicated in the previous paragraph, the boundary between the Parties therefore follows the line of deepest soundings of the main navigable channel of the River Niger as it appears in the 1970 NEDECO report, from the intersection of this line with the median line of the River Mekrou until its intersection with the boundary of the Parties with Nigeria. Opposite Gaya, the boundary is constituted by the line of deepest soundings of the left navigable channel from the point situated at coordinates 11�52'29" latitude North and 3�25'34" longitude East until the point located at co-ordinates 11�51'55" latitude North and 3�27'41" longitude East, where the boundary deviates from this channel and passes to the left of the island of Kata Goungou, subsequently rejoining the main navigable channel at the point located at co-ordinates 11�51'41" latitude North and 3�28'53" longitude East. The points that constitute the boundary line are further represented, purely for illustrative purposes, on sketch-map No. 4 (in six sheets) attached to the present Judgment FN1. 116. The Chamber will now determine to which of the Parties each of the islands in the River Niger belongs, following the course of the river downstream from its confluence with the Mekrou to the frontier with Nigeria. The Chamber has not received reliable information that new islands formed nor that islands disappeared between 1960 and 1967-1970. As regards subsequent years, it observes that one of the islands identified by Niger, namely Sandi Tounga Barou, which is not represented on any map prepared before 1973, does appear on various aerial photographs and SPOT images taken from 1973 onwards. The Chamber must consequently determine to which of the Parties this island belongs. 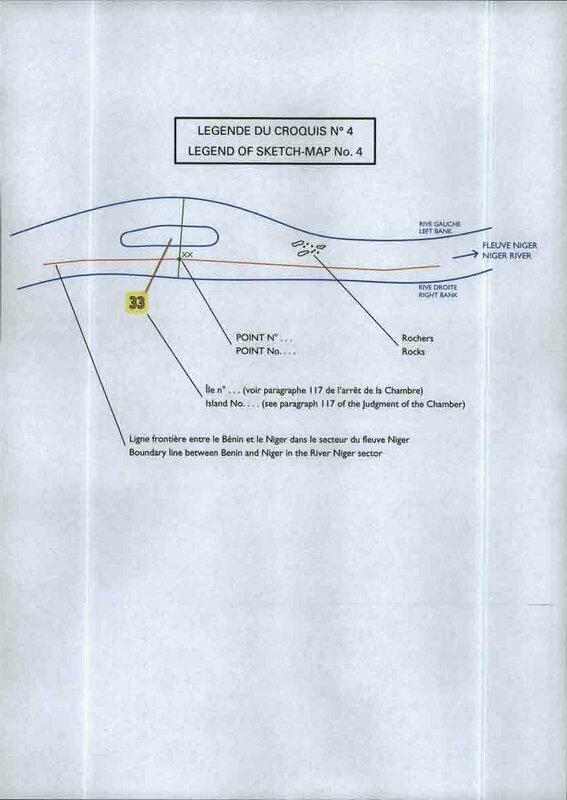 With [p140] respect to the "island" of Pekinga, which Niger in its final submissions attributed to Benin, the Chamber notes that it is not identifiable as a separate island on the maps annexed to the NEDECO report, but instead appears to be part of the river bank on the Benin side. 25. Dole Barou, also known as Barou Béri or Bani Koubaye, belongs to Niger. These various islands are shown on the illustrative sketch-map referred to in paragraph 115 above. 118. Finally, the Chamber observes that the determination in regard [p141] to the attribution of Islands effected above is without prejudice to any private law rights which may be held' in respect of those islands. 119. Niger has also asked the Chamber to determine the frontier on the two bridges between Gaya (Niger) and Malanville (Benin). Benin contends that this issue is not covered by the dispute submitted to the Chamber under the terras of the Special Agreement and that the Chamber therefore has no jurisdiction to comply with Niger's request. 120. The Chamber notes in this regard that, in the Special Agreement. "[t]he Court is requested to . . . determine the course of the boundary . . . in the River Niger sector". Since the bridges between Gaya and Malanville are located in that sector, the Chamber considers that it has jurisdiction to determine where the boundary is located on these bridges. 121. Niger contends that the boundary is situated at the middle point of each of the bridges. It observes that the construction and maintenance of these structures has been financed by the Parties on an equal basis and that the bridges are their joint property. According to Niger, it logically follows that the boundary is situated at the middle point of this joint property and does not follow the boundary line in the river itself. Niger further contends that this solution has been adopted in a substantial number of previous and existing agreements. 122. Benin, for its part, submits that the arrangements for the construction and maintenance of the bridges and any provisions on joint ownership bear no relation to the issue of territorial sovereignty. It further contends that a difference between the location of the boundary on the bridges and the course of the boundary in the river beneath would be incoherent and lead to legal inconsistencies. 123. The Chamber initially observes that the two bridges crossing the River Niger between Gaya and Malanville were built in 1958 and 1988-1989 respectively. They are more than 300 m in length and they connect platforms built on each of the banks, which are used for customs and other administrative purposes. The Chamber further observes that there are a number of arrangements in place which provide that the use and maintenance of these bridges, of which the Parties have joint ownership, is to be financed by them on an equal basis. It finally observes that these agreements and arrangements do not contain any provisions on territorial issues. 124. The Chamber notes that neither of the Parties has contended that there is a rule of customary international law regarding territorial delimitation In the case of bridges over international watercourses. It further notes that the various precedents cited in the case file are all based on bilateral agreements. The Chamber observes that, in the absence of an agreement between [p142] the Parties, the solution is to extend vertically the line of the boundary on the watercourse. This solution accords with the general theory that a boundary represents the line of separation between areas of State sov-ereignty, not only on the earth's surface but also in the subsoil and in the superjacent column of air. Moreover, the solution consisting of the vertical extension of the boundary line on the watercourse avoids the difficulties which could be engendered by having two different boundaries on geometrical planes situated in close proximity to one another. In light of the foregoing, the Chamber concludes that the boundary on the bridges between Gaya and Malanville follows the course of the boundary in the river. This finding is without prejudice to the arrangements in force between Benin and Niger regarding the use and maintenance of these bridges, which are financed by the two States on an equal basis (see paragraph 123 above). The Chamber observes in particular that the question of the course of the boundary on the bridges is totally independent of that of the ownership of those structures, which belong to the Parties jointly. 125. The Chamber is further charged under Article 2 (c) of the Special Agreement with "determin[ing] the course of the boundary between the two States in the River Mekrou sector". Although Benin contended that this issue was a "quite artificial dispute created by Niger at the time of negotiation of the Special Agreement" for tactical purposes and that until then there had never been any disagreement between the Parties on the matter � an assertion which Niger strongly denied �, there can be no doubt that the Chamber's task, according to the express terms of the Special Agreement, includes settlement of this aspect of the dispute, without having to speculate on the motives of either Party. Indeed Benin has not sought to argue otherwise. 126. The dispute between the Parties in regard to this sector of the boundary may be summarized as follows. According to Benin, the boundary follows the median line of the River Mekrou. That is said to result, on the one hand, from the application of the uti possidetis juris principle, since, at their dates of independence, the territories of Dahomey and Niger were separated by the course of that river pursuant both to the legal titles in force and to the effectiviies; on the other hand and in any event, such a boundary is said to have been confirmed by Niger's formal recognition, at the time of the negotiations between the two Parties in 1973 and 1974 with a view to the construction of the Dyodyonga dam, that the Mekrou did indeed constitute the boundary between their respective territories. In this connection, Benin [p143] relies on a Note Verbale from Niger dated 29 August 1973 and on the minutes of a meeting held on 8 February 1974 between the experts of the two Parties (see paragraph 39 above), the River Mekrou being indicated in both of these documents as constituting the boundary between the two States. According to Niger, the boundary in the sector in question follows a line comprising two parts: the first is a straight line joining the point of confluence of the River Mekrou with the River Niger to the point where the Paris meridian meets the Atakora mountain range: the second part joins this latter point to the point where the former boundary between the cercles of Say and Fada meets the former boundary between the cercles of Fada and Atakora. That is claimed to result from the combined effect of the regulatory instruments which, during the colonial period, defined the boundary between Dahomey and Niger in the sector in question, namely the decree of 2 March 1907 incorporating the cercles of Fada-N'Gourma and Say into the colony of Haut-Sénégal et Niger (to which Niger succeeded) and the decrees of 12 August 1909 and 23 April 1913 (see paragraph 39 above) modifying the boundary of the latter colony with Dahomey. As regards the documents of 1973 and 1974 relied on by Benin, Niger contends that, even assuming that they can be regarded as creating a legal obligation, such obligation is vitiated by a manifest error which would deprive it of any validity according to the rules of customary law concerning defects in international agreements, as codified in Article 48, paragraph 1, of the Vienna Convention on the Law of Treaties. Sketch-map No. 5, on page 144 below, shows the claims of the Parties in respect of the boundary in the sector of the River Mekrou. 127. The Chamber will first ascertain, by application of the principle of uti possidetis juris, what the course of the intercolonial boundary was at the critical dates of independence in August 1960. Only then is it required, if necessary, to consider the documents of 1973 and 1974 relied on by Benin in order to determine whether they could validly have produced legal effects capable of affecting the course of the international boundary as previously defined, that is to say the boundary resulting from the uti possidetis of 1960. 128. To determine the course of the intercolonial boundary at the critical date it is necessary to examine first the legal titles relied on by the Parties, with any effeciivites being considered only on a confirmatory or subsidiary basis, in accordance with the rules recalled above (see paragraphs 47 and 77). Sketch-Map No. 5. Claims of the Parties in the Sector of the River Mekrou. "is constituted, from the boundary of Togo, by the present boundary of the cercle of Gourma until it reaches the Atakora mountain range, whose summit it follows until it meets the Paris meridian, from which point it runs in a straight line in a north-easterly direction, terminating at the confluence of the River Mekrou with the Niger". 130. That delimitation, which clearly does not coincide with the course of the River Mekrou, tends to support the position of Niger. Indeed Niger accordingly contends that the decree of 2 March 1907, as partially amended in 1909 and 1913 (see paragraph 39 above), remained in force until the critical dates of independence in 1960 and that it constitutes the legal title to be relied on for purposes of applying the uti possidetis juris principle. 131. Benin, however, challenges this position, arguing that the 1907 delimitation was implicitly superseded by the decree of 1 March 1919 creating the colony of Haute-Volta, and that from 1919 onwards not one of the successive administrative instruments relating to the disputed sector mentioned the line of 1907. On the contrary, every one of those instruments, and in particular the arrêté of 31 August 1927, whereby the Governor-General of the AOF fixed the boundaries of the colonies of Haute-Volta and Niger, expressly or impliedly adopted the course of the Mekrou as the intercolonial boundary, as is moreover confirmed by abundant cartographic evidence. 132. The Chamber cannot accept the proposition that the decree of 1 March 1919 implicitly abrogated or amended that of 2 March 1907 in relation to the intercolonial boundary in the sector in question. 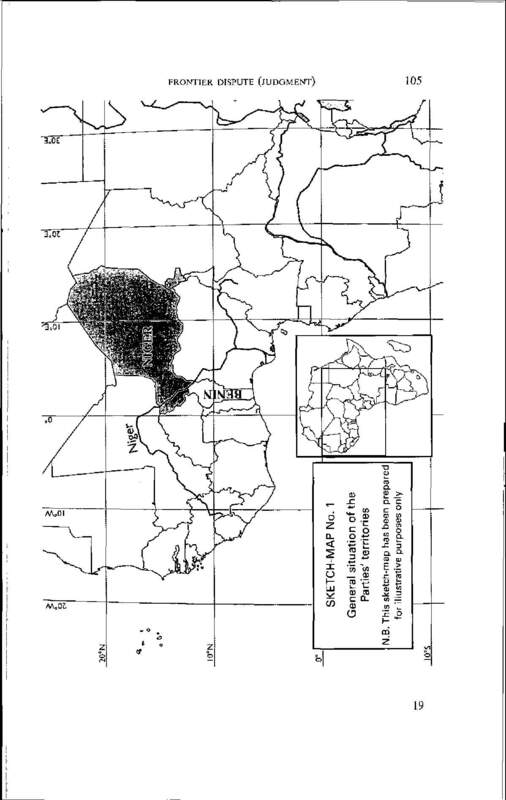 However, there is nothing in the terms of the 1919 decree to suggest that its authors intended to call into question the line defined as the intercolonial boundary in 1907, The two cercies detached from Dahomey in 1907 in order to be included in the neighbouring colony of Haut-Senegal et Niger were in 1919 incorporated into the new colony of Haute-Volta. [p146] Nonetheless, the boundary separating those cercles (and in particular the cercle of Say) from Dahomey, was not moved in 1919: nothing in the terms of the decree of 1 March 1919, nor any incompatibility between two successive texts, leads to the conclusion that the boundary clearly and precisely defined in 1907 was modified in 1919. 133. That does not suffice however to refute Benin's argument with respect to the course of the boundary in the sector concerned. 134. The Chamber is bound to note, first of all, that the 1919 decree refers neither in its citations nor in its operative articles to the 1907 decree, and that it does not include any precise definition of the intercolonial boundary, as the earlier decree had done. In reality, the 1919 decree defines the territory of Haute-Volta solely by reference to the cercles which compose it, and it is thus also by this means that it indirectly defines the boundaries between Haute-Volta and the neighbouring colonies, and in particular Dahomey. It is by the precise delimitation of the cercles mentioned in Article 1 of the decree of 1 March 1919 � a delimitation not effected by the decree itself � that, from this date, the intercolonial boundary could be defined. In particular, it was the delimitation of the cercle of Say that would then enable the boundary between Haute-Volta and Dahomey to be determined in the disputed sector. However, as recalled above (see paragraphs 30, 47 and 71), the delimitation of the cercles, the principal administrative subdivisions of the colonies, was at that time, pursuant to Article 5 of the decree of 18 October 1904 reorganizing the AOF, a matter falling within the competence of the Governor-General. It must therefore be concluded from the foregoing that, while the 1919 decree did not call into question the intercolonial boundary deter-mined in 1907, it left unaffected the power of the Governor-General to modify the boundary in the future by fixing the boundaries of the cercles in question in accordance with his normal competence in that regard. 135. The Chamber notes that the arrêté of the Governor-General of 31 August 1927 defines the River Mekrou as the boundary of the cercle of Say in the area contiguous with the colony of Dahomey. In the South-East, by the Mekrou from that point as far as its confluence with the Niger." Thus, by this arrêté the Governor-General clearly fixed the boundary of the cercle, of Say, and hence the intercolonial boundary, on the Mekrou. 136. It is true, and Niger has been at pains to point this out, that the arrêté of 31 August 1927 was followed on 15 October by an erratum amending its text retroactively by removing the reference to the course of the Mekrou as the south-eastern boundary between the cercle of Say and Haute-Volta. Article 1 of the arrêté, as amended pursuant to the erratum of 15 October, confines itself to stating that the boundary between the Niger and Haute-Volta "follows ... the course of the Tapoa upstream until it meets the former boundary between the cercles of Fada and Say, which it follows as far as its intersection with the course of the Mekrou". However, the erratum would seem in effect to have been motivated not by the fact that the Governor-General did not mean to fix the southeastern boundary of the cercle of Say along the Mekrou, but rather by a wish not to define the boundary between Dahomey and Niger in an arrêté whose purpose, as was clear from its title, was to fix the boundary between Niger and Haute-Volta. Not only did the erratum thus not contradict the fact that the boundaries of the cercle of Say were as indicated the previous August, but it expressly confirmed that the terminal point of the southern boundary of that cercle was situated on the Mekrou. 137. Furthermore, the Chamber must take account of the instruments concerning the creation of game reserves and national parks in the area known as "The Niger W". Both the Governor-General's arrêté of 16 April 1926 and the arrêtés of 30 September 1937 of the Governor of Dahomey and of 13 November of the same year of the Governor of Niger � defining within the territory of each of the two colonies the provisional extent of their nature reserves � as well as the Governor-General's arrêtés of 3 December 1952 and 25 June 1953 definitively fixing the borders of those reserves, use the River Mekrou for purposes of delimitation of the areas in question. If, in the eyes of the administrative authorities competent to promulgate the arrêtés in question, the Mekrou did not represent the intercolonial boundary, it is difficult to see why it should have been chosen as the boundary of these national parks and nature reserves. 138. Finally, the Chamber is bound to note that the cartographic material in the file clearly confirms that, certainly from 1926-1927, the Mekrou was generally regarded as the intercolonial boundary by all the administrative authorities and institutions of the colonial Power. Certainly, maps � unless they are annexed to an administrative instrument, and hence form an integral part thereof, which is not the case here � possess only the relative force conferred upon them by the jurisprudence recalled above (see paragraph 44), However, in the present case the cartographic evidence may be regarded as confirming and reinforcing the conclusions flowing from an analysis of the above-mentioned regulative texts. The same applies notably to the map prepared and published in October 1926 by the AOF Geographical Service (known as the "Blondel la Rougery map"), to the map entitled "New Boundary of Haute-[p148] Voltâ and Niger (according to the erratum of 5 October 1927 to the arrêté of 31 August 1927)" and to the Dahomey-Togo roadmap prepared by the AOF Geographical Service in 1938 (see paragraph 42 above). 139. All of the foregoing considerations confirm the position that the 1907 line no longer corresponded, at the critical date, to the intercolonial boundary and that, on the contrary, at that date, it was the course of the Mekrou which, in the view of all the competent authorities of the colonial administration, constituted the boundary between the adjacent colonies � at that date the colonies of Dahomey and Niger. 140. The Chamber observes that, as argued by Niger, the decree of 2 March 1907, which clearly defined a different boundary, was never expressly abrogated or amended, or indeed superseded by some other instrument of at least equal authority � either a decree or a statute � containing provisions clearly incompatible with its own. Nor indeed was any instrument of this kind cited by Benin in reply to a question from the Chamber on this aspect of the dispute, with the exception of the 1919 decree, which, as explained above, did not have the abrogating effect claimed for it by Benin. However, further to what has already been said (see paragraph 134) in regard to the power of the Governor-General to fix the boundaries of the cercles and, hence, to determine those of colonies, the Chamber would emphasize that the uti possidetis juris principle requires not only that reliance be placed on existing legal titles, but also that account be taken of the manner in which those titles were interpreted and applied by the competent public authorities of the colonial Power, in particular in the exercise of their law-making power. The Chamber is bound to note that, the administrative instruments promulgated after 1927 were never the subject of any challenge before the competent courts, and that there is no evidence that the colonial administration was ever criticized at the time for having improperly departed from the line resulting from the 1907 decree. It is not for the Chamber to substitute itself for a domestic court (in this case, the French administrative courts) by carrying out its own review of the legality of the instruments in question in light of the 1907 decree, nor to speculate on what the French courts might bave decided had they been seised of the matter. The fact is that they were not so seised and that there is nothing to suggest that, in the decisions taken by them after 1927, the administrative authorities either manifestly exceeded their powers or acted in manifest breach of the applicable rules. 141. It follows from all of the foregoing that, at least from 1927 onwards, the competent administrative authorities regarded the course of the Mekrou as the intercolonial boundary separating Dahomey from Niger, that those authorities reflected that boundary in the successive instruments promulgated by them after 1927, some of which expressly [p149] indicated that boundary, whilst others necessarily implied it, and that this was the state, of the law at the dates of independence in August 1960. In these circumstances, it is unnecessary to look for any effect ivities in order to apply the uti possidetis principle, since effectivites can only be of interest in a case in order to complete or make good doubtful or absent legal titles, but can never prevail over titles with which they are at variance. The Chamber notes moreover, ex abundanti, that the effectivites relied on by the Parties in the sector in question are relatively weak. 142. In the light of the preceding conclusion, the dispute between the Parties regarding the legal effect of Niger's Note Verbale of 29 August 1973 and of the minutes of the meeting of experts of 8 February 1974 becomes moot. It is thus unnecessary to decide whether those documents could have constituted a legally binding obligation for Niger and, if so, whether that obligation could have been vitiated by an error fulfilling the conditions laid down by customary international law. 143. Lastly, it remains for the Chamber to determine the exact location in the River Mekrou of the boundary between Benin and Niger. In this respect, in its final submissions Benin requested the Chamber to adjudge and declare that, in this sector, the boundary follows "the median line of the River Mekrou". Niger did not expressly adopt a position on this question, even on an alternative basis; it did, however, contend in its written pleadings that the eastern starting point.of the bound-ary in that sector (corresponding to the western terminal point of the boundary in the River Niger sector) is constituted by the "confluence of the River Niger with the Mekrou", which it locates at "the intersection of the thalweg of the River Mekrou with the main channel of the River Niger" or at the "point of intersection of the axes of the River Niger and the River Mekrou". "plotted the co-ordinates of the point of intersection of the axes of the River Niger and River Mekrou, but was not able to continue its work beyond that point because navigation on the River Mekrou [was] not possible due to the low water level". Moreover, the Parties did not provide the Chamber with any documents that would enable the exact course of the thalweg of the Mekrou to be identified. The Chamber notes that in all likelihood there is a negligible difference between the course of the thalweg and the course of the median line of the River Mekrou, but considers that, in view of the circumstances, including the fact that the river is not navigable, a boundary following the median line of the Mekrou would more satisfactorily meet the requirement of legal security inherent in the determination of an international boundary. 145. The Chamber concludes, for the foregoing reasons, that, in the sector of the River Mekrou, the boundary between Benin and Niger is constituted by the median line of that river. Finds that the boundary between the Republic of Benin and the Republic of Niger in the River Mekrou sector follows the median line of that river, from the intersection of the said line with the line of deepest soundings of the main navigable channel of the River Niger as far as the boundary of the Parties with Burkina Faso. Done in French and in English, the French text being authoritative, at the Peace Palace, The Hague, this twelfth day of July, two thousand and five, in three copies, one of which will be placed in the archives of the Court and the others transmitted to the Government of the Republic of Benin and the Government of the Republic of Niger, respectively. Judge ad hoc Bennouna appends a dissenting opinion to the Judgment of the Chamber. Sketch-Map No. 4. Boundary Line Between Benin and Niger in the River Niger Sector. Nor do I accept the reasoning underlying these ﬁndings. I likewise agree with the reasoning underlying this ﬁnding. [FN1] On the role of the judge ad hoc, Thomas Franck took a similar view in his dissenting opinion in the case concerning Sovereignty over Pulau Ligitan and Pulau Sipadan (Indonesia/Malaysia), Judgment, I.C.J. Reports 2002, pp. 693-695. 6. Under the terms of this provision the Chamber must seek to ascertain what the territorial title was, basing itself on the colonial heritage according to colonial law at the �critical date� of the passage of the two Parties to international sovereignty. However, inasmuch as the principle of uti possidetis juris is of a dispositive character, and the Parties are able to derogate from it by joint agreement, the Special Agreement does not preclude the Chamber from taking account of international obligations undertaken by the two independent States. Thus the Court is called upon to apply the rules and principles of international law set out in Article 38 of its Statute, that is to say, in particular, �international conventions whether general or particular, establishing rules expressly recognized by the contesting States�. 7. The Chamber must begin by examining the colonial legacy, namely the law promulgated by the colonial Power and the international obligations undertaken by it, as well as the manner in which public authority was exercised in the colonies, before turning to the norms of international law binding the two Parties following their accession to independence. The logic of this approach is to determine the course of the boundary at the critical date and the territorial conﬁguration of the two new States, before considering any subsequent obligations entered into by them which conﬁrm or deny the colonial heritage (and to what extent they do so). 8. The Parties have thus designated as primary source a substantive body of law, the colonial heritage, which the Chamber must examine ﬁrst, before considering whether there are other obligations which have become binding on the Parties following independence. Benin and Niger achieved independence on 1 and 3 August 1960 respectively, which means that the critical date for determination of the colonial heritage falls within this period, at the beginning of August 1960. 10. Given that these are two countries, Benin and Niger, which before 1960 were subject to the sovereignty of the same colonial Power, France, the Chamber�s task is to determine the administrative boundaries between the two colonies according to French colonial law at the critical date. 13. Thus it is in August 1960, the critical date, that the legal title or effectivit�s have to be determined in this dispute between Benin and Niger, and not by reference to a colonial practice some years or decades prior to that time, which may be regarded as a parenthesis that occurred within the colonial period and came to an end before independence. 14. Colonial law is not to be considered in itself as basis of the territorial title; it is simply �an element of fact� � conﬁrmation of the title promulgated by the colonial Power, and hence evidence of the colonial heritage. 15. Nonetheless, in seeking to ascertain �the colonial fact� at the critical [p156] date, the Chamber will accord precedence to the legal title, as embodied in colonial law, over the effectivit�, namely the fact that the disputed territory was administered in practice by a particular colonial authority. 16. Certainly, in the total absence of any legal title, the judge must examine the state of the effectivit�s, which necessarily gives him a greater margin of discretion in determining the weight to be accorded to a particular administrative practice. These are effectivit�s �at the critical date�. Thus, if the practice of the administrative authorities underwent a clear change at that date, the Chamber must take account of such change as part of the colonial heritage; particularly if this new practice stems from an uncontested intention and will to act as exclusive holder of authority over the portion of territory in dispute. 17. However, where a legal title exists but leaves the course of the boundary undetermined, it is for the judge to consider to what extent the conduct of the administrative authorities at the critical date can provide an authentic interpretation of the title in question; that is to say, using the language of the Court which I have just cited, �how the title is interpreted in practice�. In this case the effectivit� serves not to replace a defective title, but to complete an imprecise title. 18. In the River Niger sector, Benin has in my view demonstrated the existence of a legal title whose content and scope, at the critical date, enable the Chamber to place the boundary between the two States on the left bank of the River Niger (A). Furthermore, in so far as the Chamber found that neither Party had any legal title, it ought to have accorded precedence at the critical date to the effectivit�s of Benin (B). 19. Before addressing the legal title proper, it is helpful brieﬂy to recall the historical circumstances surrounding the creation by France of the [p157] colonies of Benin (Dahomey) and Niger, which will throw light on the course of their boundaries. 20. What should be noted from this historical background is that the creation of the colony of Dahomey predated that of Niger. [FN2] In 1885, starting from its trading posts in the Bight of Benin, France attempted to reach the River Niger, and beyond it Sudan and its other possessions in Africa. The �colony of Dahomey and dependencies�, created by decree of 22 October 1894, was by arr�t� of 11 August 1898 extended as far as the River Niger and beyond by incorporation of a new �cercle of Moyen-Niger�. This became possible following the conclusion on 21 October 1897 of a treaty of protection between France and the King of Dendi (whose kingdom extended to both sides of the Niger). Two years later, by an arr�t� of 17 October 1899, the colony of Dahomey was incorporated into French West Africa (AOF). [FN2] The Chamber recalls and emphasizes (paragraph 34 of the Judgment) that the colony of Dahomey �encompassed, in the region concerned by the recent dispute, territories situated on both banks of the River Niger�, but it draws no conclusion from this in relation to the delimitation and to the reference in the instruments of 1900 to �the left bank of the River Niger� as the boundary. 22. Thus, while the boundaries of the future colony of Niger are not yet deﬁned in this arr�t�, there is one at least which will not change, namely the �left bank of the Niger�, or indeed the territory�s southern boundary. 23. The terms of this arr�t� were conﬁrmed by a decree of 22 December 1900, which created a military territory by detaching it from the �cercle of Moyen-Niger� (the former Dendi kingdom), which extended over both banks. 24. It was not until the decree of the President of the Republic of 13 October 1922 that the �autonomous colony� of Niger was created out of the �civil territory�, which had replaced the �military territory�. 25. It should be noted that a map of French West Africa published in 1922, shortly after the creation of the colony of Niger, clearly places the boundary on the left bank of the River Niger (Memorial of Niger, Annexes, Series D, map No. 28), thus conﬁrming that this colony, created inter alia by detaching certain territories from Dahomey, started [p158] from a line constituted by the left bank of the river, the remainder of the river being regarded as an integral part of Dahomey. 26. Such is the historical background, which provides the key to an understanding of the subsequent development of the issue of the boundaries between the two colonies, and in particular the uncertainties by which it was characterized, at least until 1954, when there was a clear and agreed interpretation of the original founding instruments, adopted in 1900, that provided the basis for colonial policy in the region. 27. Thus, with French colonial continuity playing its part in the process, successive ofﬁcials simply adopted the �course of the River Niger� as the boundary, particularly as the colonial administration had decided from the outset that the River Niger, from Niamey to Gaya, would be managed as a continuous whole (the section within Niger proper and the boundary section). Management of the river was delegated by the Governor-General of French West Africa ﬁrst to the authorities of Niger and then, from 1934, to those of Dahomey. 28. It is thus hardly surprising that henceforth no one concerned them-selves with the instruments of 1900, or with the fact that the administrative boundary between the two colonies had been ﬁxed on the left bank of the river, since the sole major interest of any delimitation, namely management of navigation on the river, was in the hands of the central colonial authorities. 29. As regards the modus vivendi of 1914, which we know of only by �hearsay�, it would appear to derive from action by local ofﬁcials, faced from 1914 with disputes between pastoralists over certain islands in the river. It is in any event clear that these local ofﬁcials received no response from their superiors in regard to this purported �modus vivendi�, which sought to take as the boundary the centre of the river�s main channel and to attribute the islands accordingly. Given that this was in any case a local arrangement for the settlement of disputes between Peuhls from the two banks visiting the islands in the river, the modus vivendi in question, which was never approved by the competent authorities of the two colonies, could neither be relied on as a legal title nor create an effectivit� on which one or other of the independent States might rely. [FN3] The concern of these local ofﬁcials was to reach agreement regarding the local population for whom each of them was personally responsible and not to settle a dispute over borders and attribution of territory, which were manifestly matters outside their competence. 30. Administrators adopted the River Niger as the physical boundary [p159] between the two colonies, and were little concerned as to its precise location � on the bank, on the median line or at the thalweg. This is in all probability why the arr�t�s of 7 December 1934 and 27 October 1938, �reorganizing the territorial divisions of the colony of Dahomey�, referred to the �course of the Niger� as the north-eastern boundary of the frontier cercle of Kandi. However, these texts, whose primary concern was economic and administrative harmonization, took no account of the practice adopted since 1914 by local ofﬁcials on both banks in order to settle disputes between Peuhls who grazed their herds on the islands. 31. Nevertheless, that practice did not sufﬁce to prevent numerous dis-putes over grazing on the islands, which sometimes required intervention by security forces from one or other of the colonies. It was after one of these incidents, which had required intervention by Dahomeyan forces in order to restore order on an island opposite Gaya (Niger), that the head of that subdivision wrote to the Governor of Niger on 23 July 1954, through the commandant of the cercle of Dosso, asking for �all relevant information regarding the islands in the river belonging to Niger or to Dahomey� (Counter-Memorial of Niger, Annex C120). �all along the river�s banks there are constant population movements according to the seasons or to grazing conditions, or when the inhabitants seek to escape payment of income or livestock taxes or grazing charges� (letter No. 992/APA, Memorial of Benin, Annex 66). For the ﬁrst time, administrators recognized the ineffectiveness of the modus vivendi for settling disputes between Peuhls and raised with their superiors the question of the territorial attribution of the islands between the two colonies. �[t]he boundary of the Territory of Niger is constituted by the line of highest water, on the left bank of the river, from the village of Bandofay to the frontier of Nigeria [and that] [c]onsequently all the islands situated in this part of the river form part of the Territory of Dahomey� (letter No. 3722/APA, Memorial of Benin, Annex 67). 34. However, Governor Raynier did not invent this boundary on the left bank, particularly as it was unfavourable to the colony under his administration. In our view, he was simply taking account of the founding [p160] texts of 1900 and of the circumstances in which the colony of Niger was created. That is why the Governor�s letter only makes sense if read in conjunction with those texts, even though it makes no speciﬁc reference to them. The Governor of Niger could not have given his response lightly, knowing that his letter would have consequences on the ground. 35. Governor Raynier�s letter of 27 August 1954 is not a simple com-munication internal to the colony of Niger, incapable of having any effect outside it. On 27 October, the commandant of the cercle of Dosso (Niger), to whom the letter was addressed, passed it on to his counterpart on the other side of the river, the commandant of the cercle of Kandi (Dahomey), explaining that �the territorial boundary . . . is entirely favourable to Dahomey� and asking him if he would have �any objection to these facilities [facilities of Gaya subdivision located on the island] being retained there, at least for the time being� (letter No. 576, Memorial of Benin, Annex 68). 36. The commandant of the cercle of Kandi, Mr. Daguzay, passed this information to the Governor of Dahomey in a letter of 12 November 1954, adding that he was �in favour of continuing to allow Niger to retain its facilities there�. 37. This correspondence ends with a letter from the Governor of Dahomey to his counterpart in Niger, taking note of the fact that the boundary of the colony of Niger was located on the left bank of the river and declaring himself prepared not to dispute �the customary rights of the inhabitants of Niger over certain of these islands�, or to raise the question of the existing �facilities�, and requesting ﬁnally �references to the instruments or agreements determining those boundaries� (letter No. 2475/APA of 11 December 1954, Memorial of Benin, Annex 70). Clearly, the Governor of Dahomey did not conduct any research going beyond the �imprecise� arr�t�s of 1934 and 1938, whilst the Governor of Niger did not see ﬁt to reply to his enquiry. 38. The fact remains that administrators accepted that the boundary lay on the left bank of the River Niger, thus going back to the founding texts of 1900. The letter of 1954 was written in a context of total uncertainty regarding the attribution as between the colonies of the various islands in the river, which was the only question really at issue in the determination of the boundary between the two colonies. Up to that time administrators had concerned themselves with the rights of the local population moving to and from the islands and not with the territorial rights of the two colonies. 39. It has been asked why Governor Raynier�s letter of 27 August 1954 restricted itself to the boundary �between Bandofay and the frontier with Nigeria�. In reality, it was precisely along this stretch of the river that the disputed islands were located. Moreover, it was when the land in dispute was of greater importance than navigation, and the course of the river was in any case unstable, that boundaries were placed on river banks, particularly during the colonial period. Furthermore, during this same period we ﬁnd �the boundary on the [p161] bank� being deﬁned as �the line of highest water�, excluding any claim to ﬂooded banks. Benin has, moreover, never sought to use this deﬁnition of the boundary in order to lay claim to any portion of Niger�s territory on the left bank. 40. I consider that Raynier�s letter of 27 August 1954 constituted a reminder that Dahomey had title, as established in 1900, over the boundary portion of the river with Niger and over the islands situated therein. The reaction to this letter shows that there was no competing title in 1954 and right up to August 1960, the �critical date� for determination of the territorial dispute between Benin and Niger. Thus, while the modus vivendi of 1914 could not constitute a legal title, the arr�t�s of 1934 and 1938, by referring to the �course of the river�, without further precision, were not intended to ﬁx the boundary between the two colonies, although they described its general course. 41. Whilst the Chamber was unable to discover any �conﬁrmation� of a boundary in the letter from Governor Raynier, since in its view no boundary was established in 1900, it nonetheless adds that it is, �however, aware of the fact that the letter of 27 August 1954 may have led to certain effectivit�s� (Judgment, paras. 65 and 67). The Chamber accordingly devoted a separate section of its reasoning (Judgment, paras. 89 et seq.) to �the effectivit�s in the period from 1954 until the critical date in 1960�, acknowledging that during this period �the claims of Dahomey to be entitled to administer the island of L�t� became more frequent�. 42. It was thus by reference to the 1954 letter that administrators expressed with increasing clarity an �animus� or intention to act as exclusive holders of territorial authority over the islands in the river, and in particular the most important and signiﬁcant one, L�t� Island. That intention was demonstrated in particular in the levying of taxes in respect of grazing rights by ofﬁcials from Dahomey and in the intervention of the colony�s security forces to restore order in the event of disputes or incidents. 43. It has been established, in any event, that from 1954 onwards ofﬁcials from Dahomey exercised territorial authority over L�t� Island,  collecting taxes and intervening to restore order, as the Chamber itself notes (Judgment, paras. 90 et seq.). The fact that, during the same period, certain prior practices were continued, such as the retention of L�t� Island on the list of Niger�s polling stations, can be explained by the slowness of the administration in adapting to the new situation resulting from the 1954 exchange of letters. However, what counts in order to establish the uti possidetis juris is the �photograph of the territory�, that is to say, the latest state of the effectivit�s and of how the status of the territory at issue was perceived. And those elements unquestionably tip the balance in favour of attribution of the islands, and in particular L�t� Island, to Dahomey. 44. The Chamber is aware of the signiﬁcant development that occurred in 1954 and of the changes in the effectivit�s during the period 1954-1960, acknowledging that �[t]he situation is less clear� than before (Judgment, para. 100). However, inﬂuenced by the practice arising from the so-called �modus vivendi� of 1914, the Chamber gives preference to the effectivit�s of Niger and ﬁnds that the boundary between the two colonies follows �the line of deepest soundings in the River Niger�, without showing that such a boundary was retained and respected after 1954, or that this was still the case at the �critical date� in 1960. 45. True, as the Chamber recalls (Judgment, para. 102), the �concept of the intention and will to act as sovereign� cannot purely and simply be �transplanted� in order to assess the conduct of a colonial authority in its colonies, and thus the effectivit�s. However, that does not mean to say that this should not be done by adapting the concept to the situation of a colonial authority, for that is the only way to distinguish between acts of toleration (for example, in regard to grazing by the Peuhls) and the exercise of territorial authority. 46. There is no doubt that the coexistence of territorial rights on L�t� Island with simple toleration of members of other groups was capable of creating tension and even degenerating into serious incidents, such as those which, during the night of 29 June 1960, led to the death of four Peuhls and the burning of several dwellings. It was, as the Chamber notes (Judgment, para. 96), the commandant of the cercle of Kandi who was responsible for informing the Minister of the Interior of Dahomey that order had been restored, even though the police unit stationed on the island came from both colonies (which was justiﬁed by the fact that the clashes involved inhabitants from both banks). In any event, the Prime Minister of Dahomey, citing the 1954 letter, considered on 29 July 1960 that the territorial question had already been settled. It is therefore apparent to me that, according to the territorial �photograph�, the colonial heritage with respect to L�t� Island was in favour of Dahomey. 47. I accordingly conclude that the boundary between Benin and Niger in the River Niger sector is situated on the left bank of the River Niger, on the basis of the legal title established in 1900 and clearly  reafﬁrmed in relations between the two colonies in 1954. Consequently, all the islands in the River Niger belong to Benin. Moreover, the effectivit�s on the islands from 1954 to 1960 also support such an attribution. 48. Turning to the question of the course of the boundary on the two bridges which cross the River Niger, I cannot agree with the Chamber�s interpretation of the Special Agreement of 15 June 2001, when it considers that, since those bridges form part of the �River Niger sector�, it is entitled to rule on the matter. The Special Agreement must be interpreted stricto sensu as concerning the River Niger (waterway and banks, including the islands); if the Parties had intended the Chamber also to ﬁx the course of the boundary on the bridges, they would have stipulated this as they did for the islands. I thus consider that the Chamber has exceeded its jurisdiction and the mandate entrusted to it by the Parties in ﬁxing the boundary on the bridges which cross the river. It is for the Parties to ensure that full effect is given to the Judgment, including with respect to co-operation on the river and the delimitation of the boundary on any present or future bridges crossing it. 49. It is true that neither Benin nor Niger is responsible for the colonial history that they inherited on independence. The two countries should be credited for having sought a judicial settlement of their border dispute and for having undertaken to pursue their co-operation in respect of the boundary rivers, the Niger and the Mekrou, whatever the terms of the Judgment rendered by the Chamber.